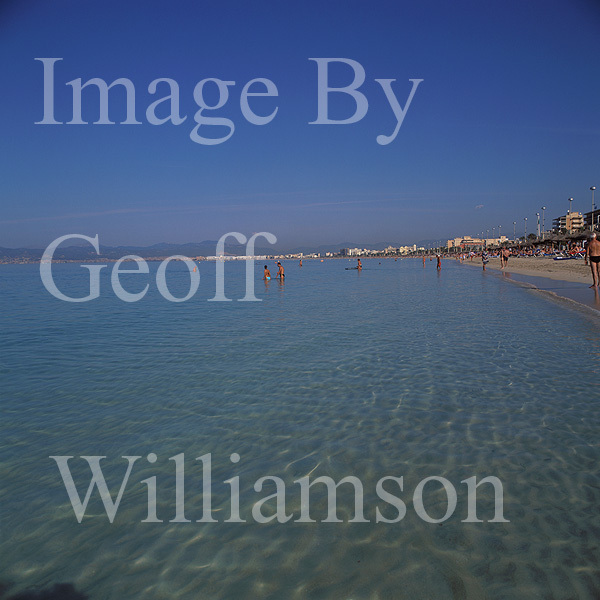 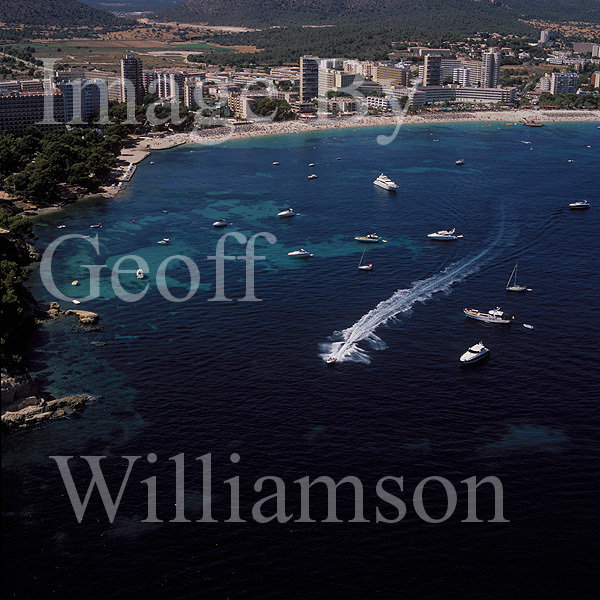 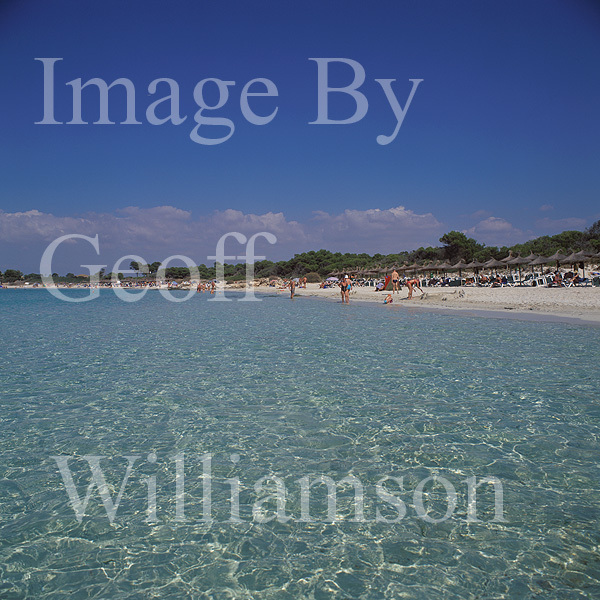 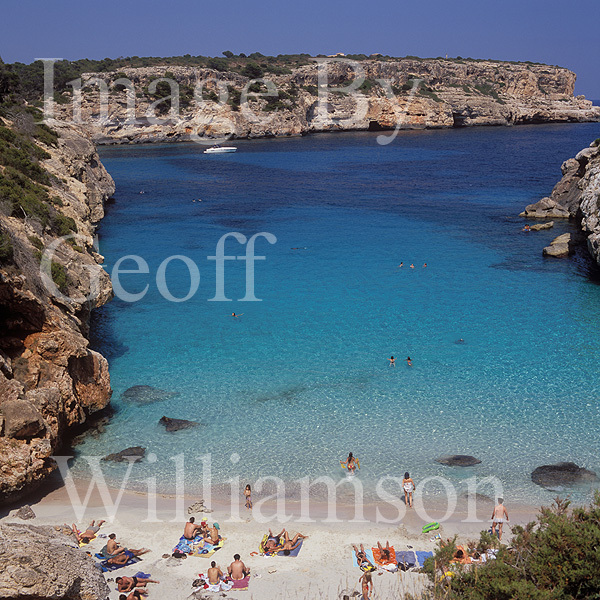 Images + descriptions of many of the beaches and bathing locations around Mallorca - both well known and remote gems. 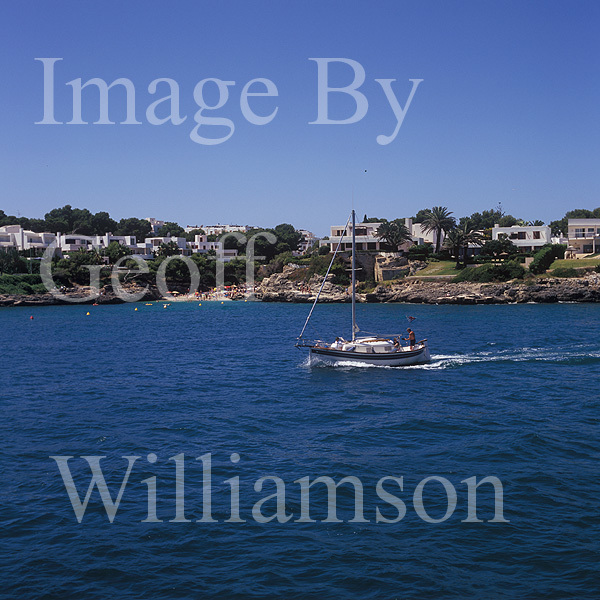 Royal Cruising Club Pilotage Foundation. 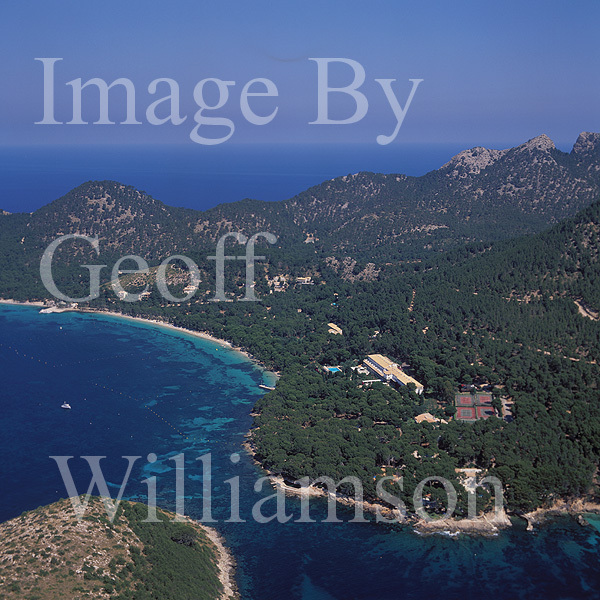 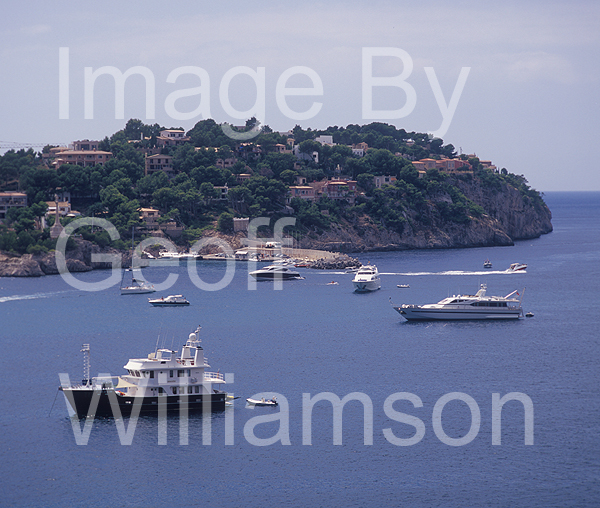 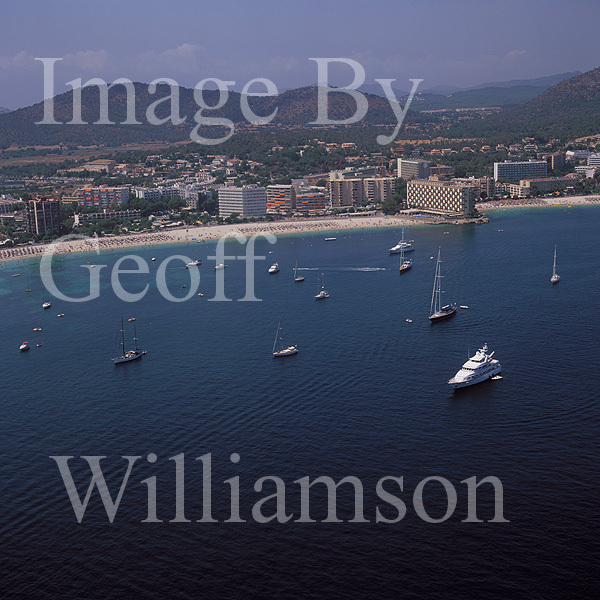 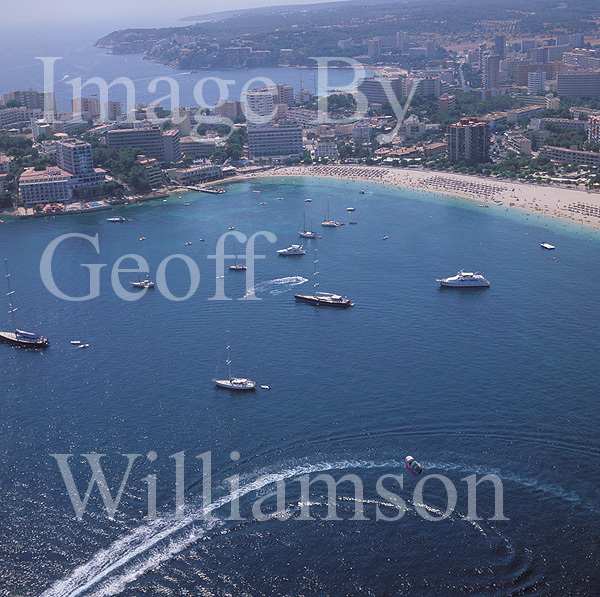 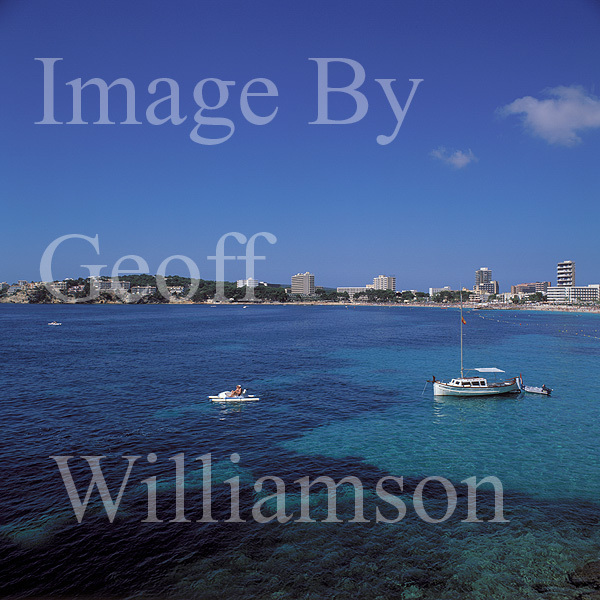 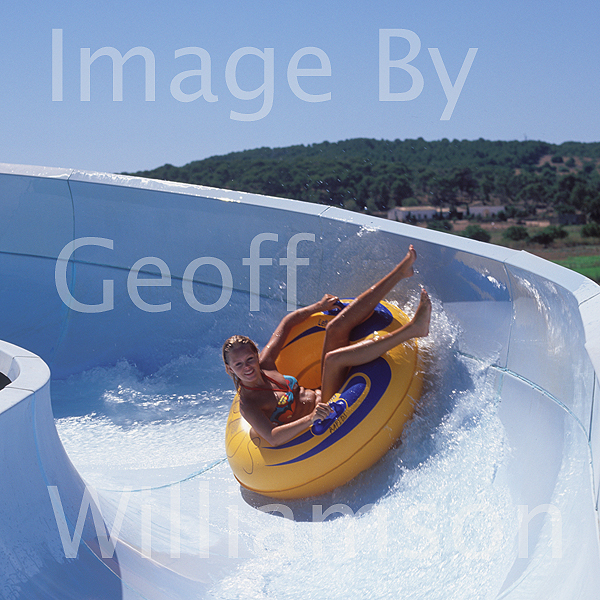 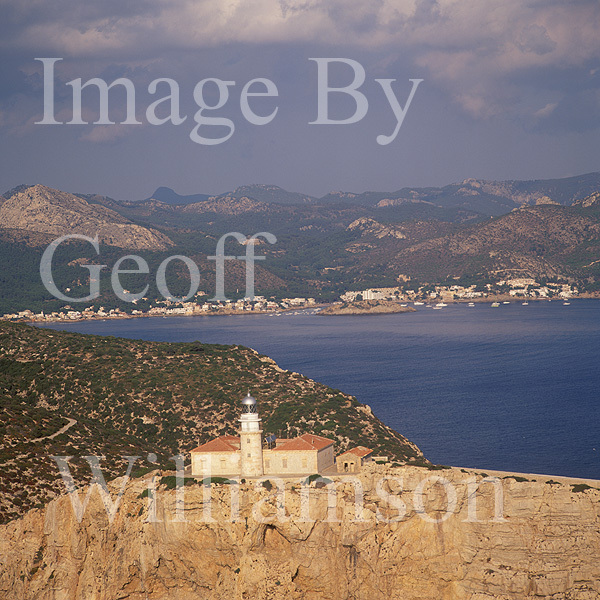 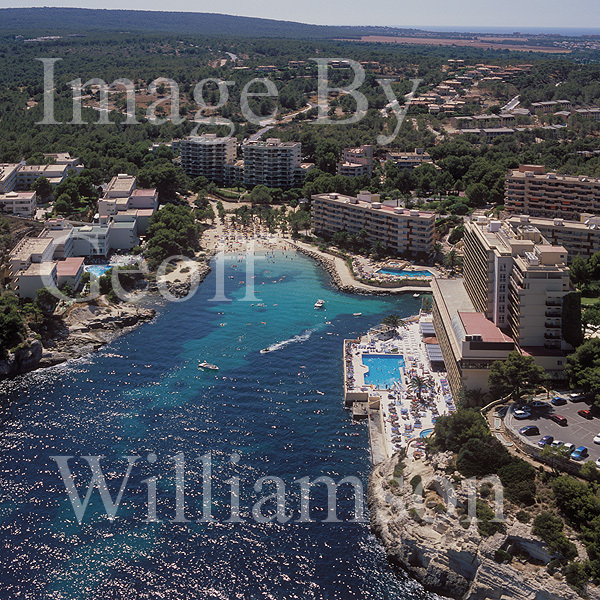 - proceed down page to view beaches clockwise from Formentor headland or Click Here. 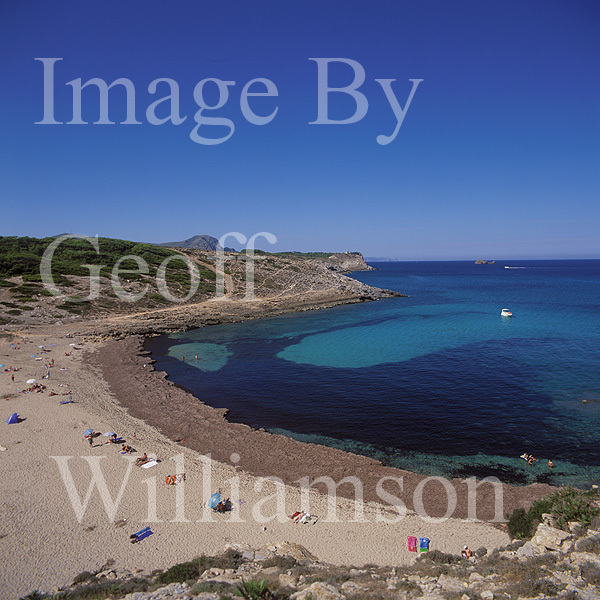 ( for 2010 72 beaches in the balearics have been awarded the coveted Blue Flag status indicated by BF below - it should be remembered that some of the smaller and perhaps more remote beaches have probably not been considered for Blue Flag status). 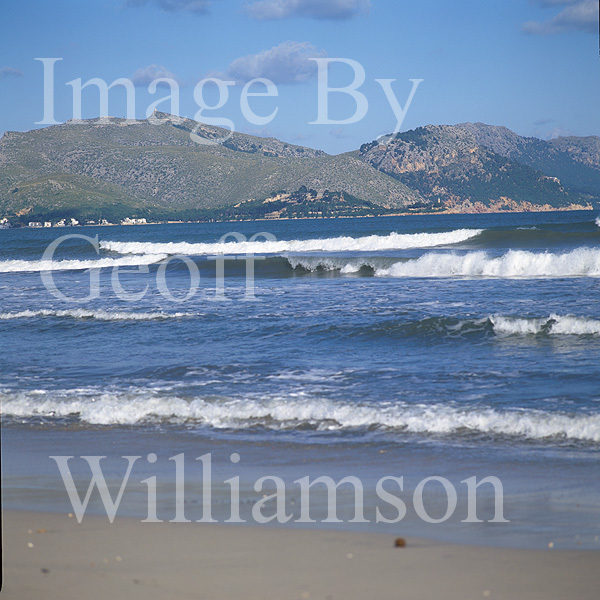 Formentor Beach / Platja de Formentor. 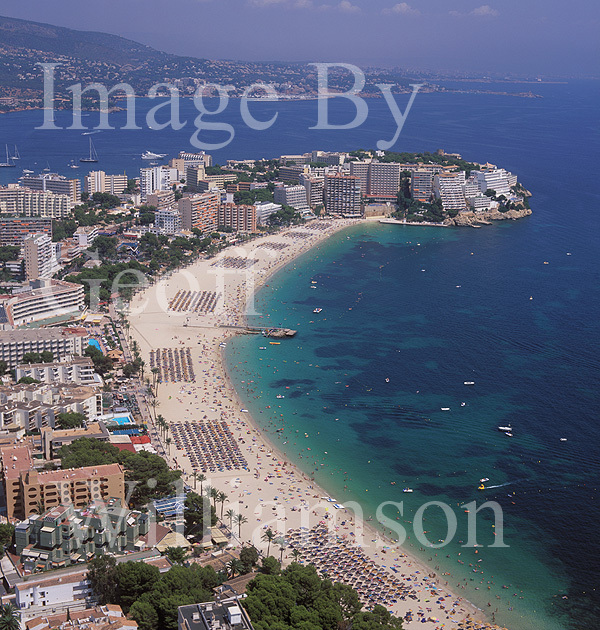 Aerial view of Formentor Beach / Platja de Formentor near the historic Hotel Formentor (guests have included UK war time Prime Minister Sir Winston Churchill, Sir Peter Ustinov, Tito Citaddini, the Count of Keyserling, the Princess of Wales, Charlie Chaplin, Rainaldo Luza and Douglas Fairbanks - see Celebrity Mallorca) and Isla Formentor on the southern edge of Formentor peninsular. 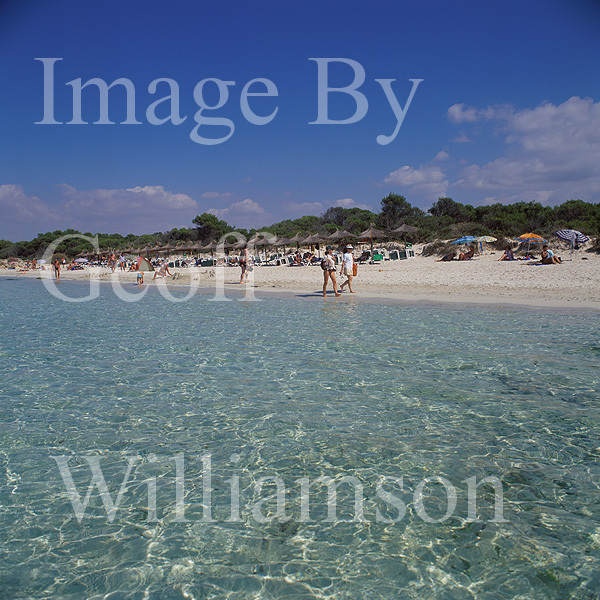 A popular sandy beach with clear waters. 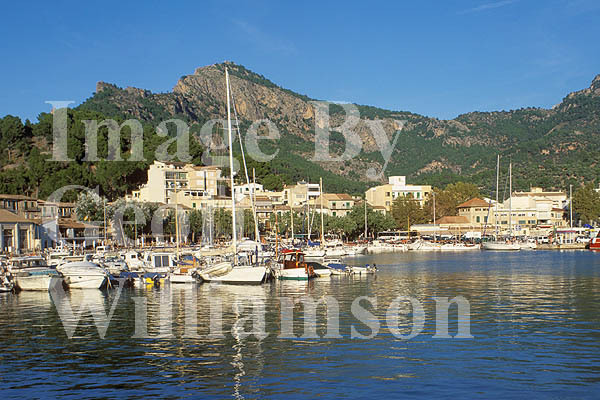 The bay of Pollensa boasts long sandy beaches - popular with sun worshippers, swimmers and watersports enthusiasts. 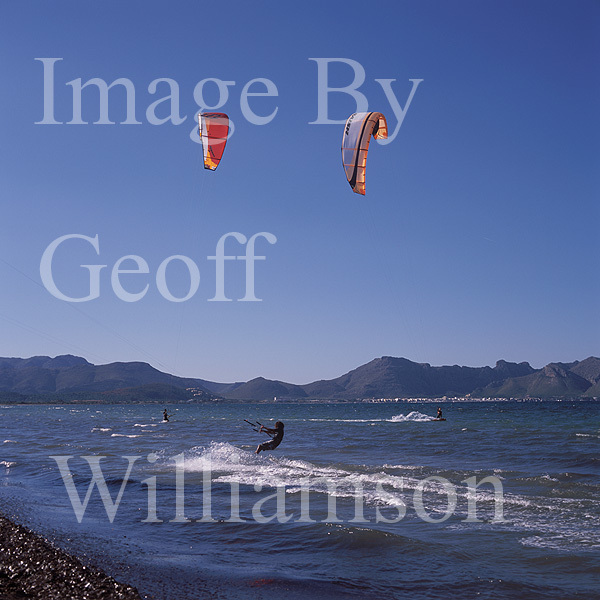 The southern end of the bay attracts kite surfers. 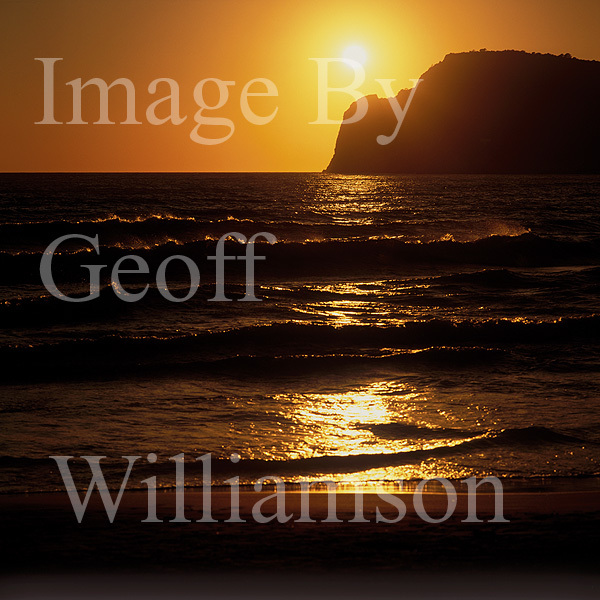 Can attract stormy seas in Winter. 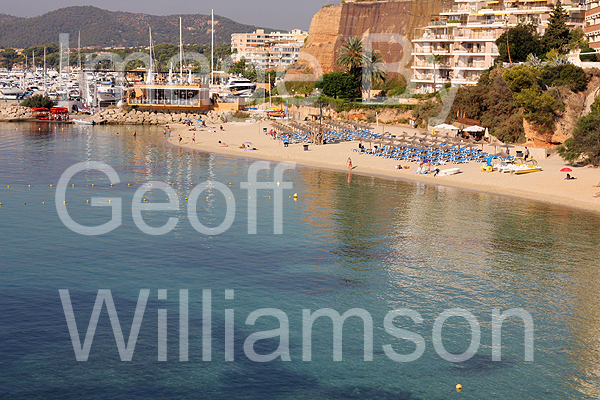 A long stretch of sandy beach and shallow waters - backed by quality hotels and popular with families. 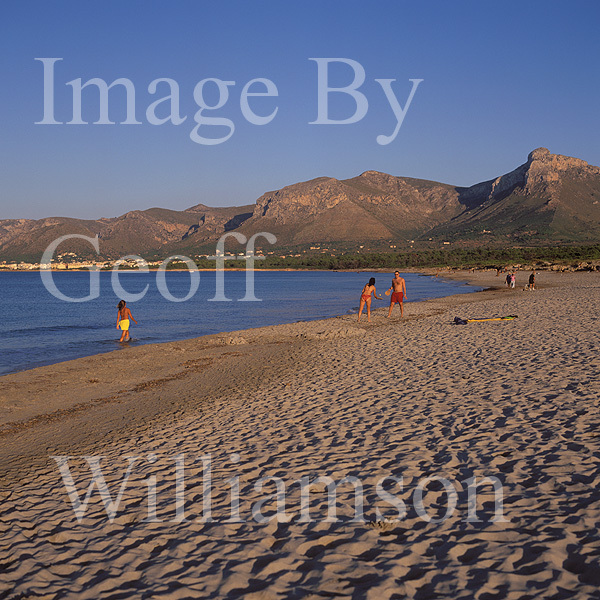 Sandy beach at Son Baulo, Can Picafort. 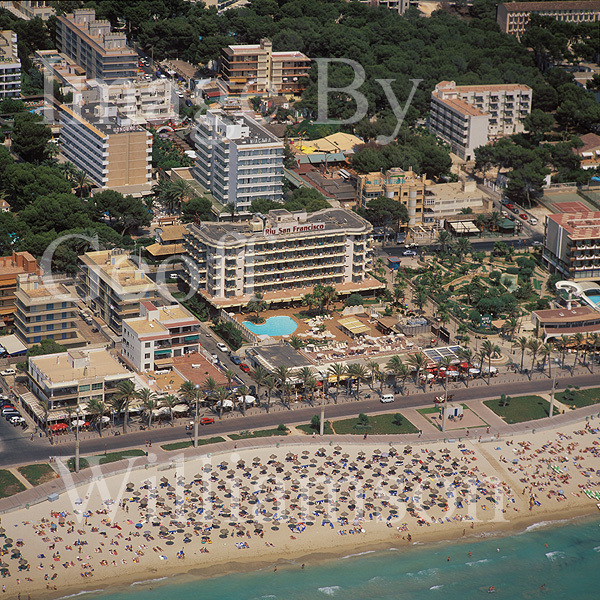 Sa Canova beach / Platja de Sa Canova. 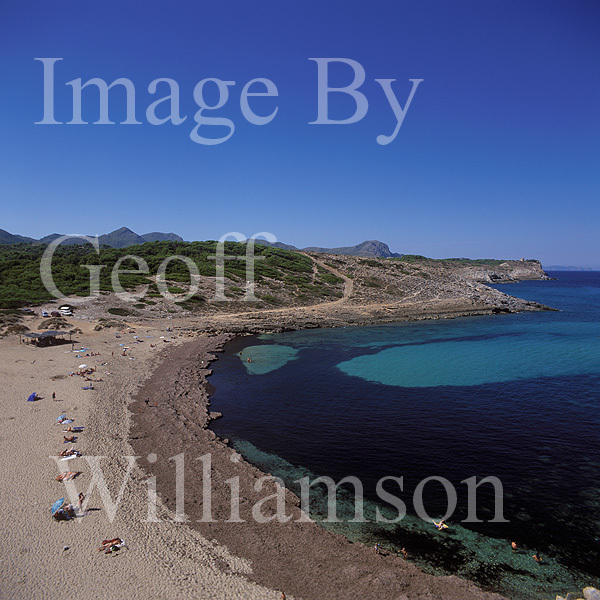 Long sandy beach between Can Picafort and Cap de Ferrutx. 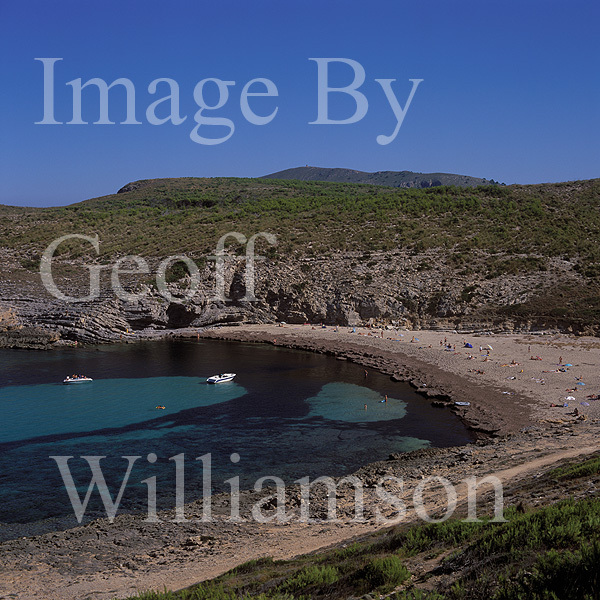 Cala Mitjana, adjacent to and North West of Cala Torta. 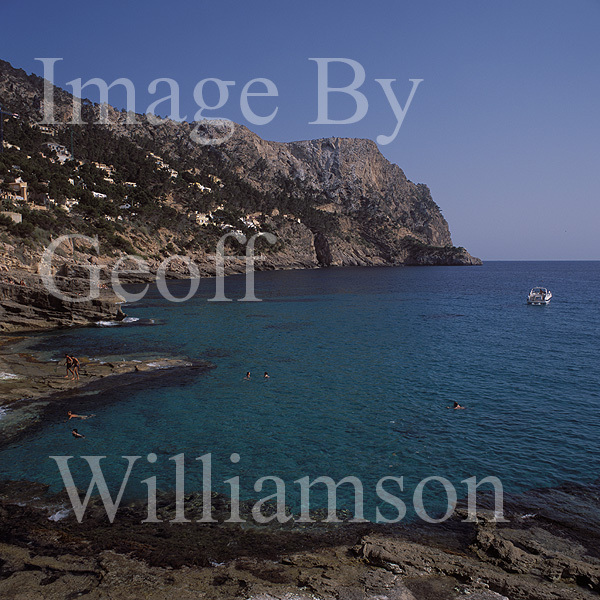 Cala Torta, adjacent to and South East of Cala Mitjana. 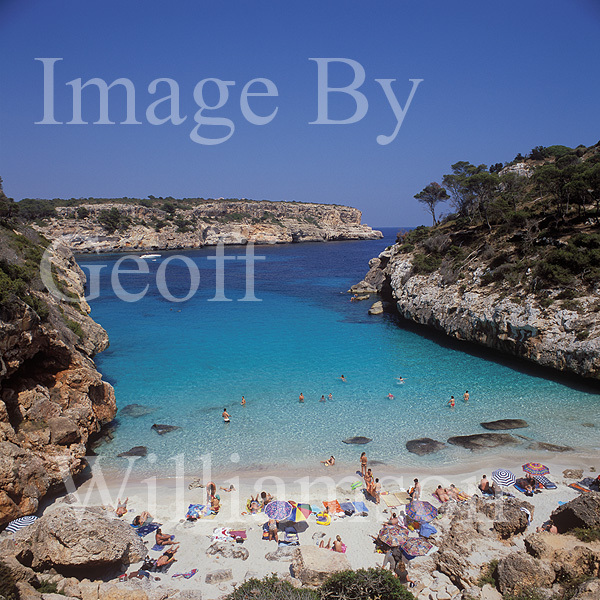 Remote sandy beach ( with seaweed deposits ) and clear waters for swimming. 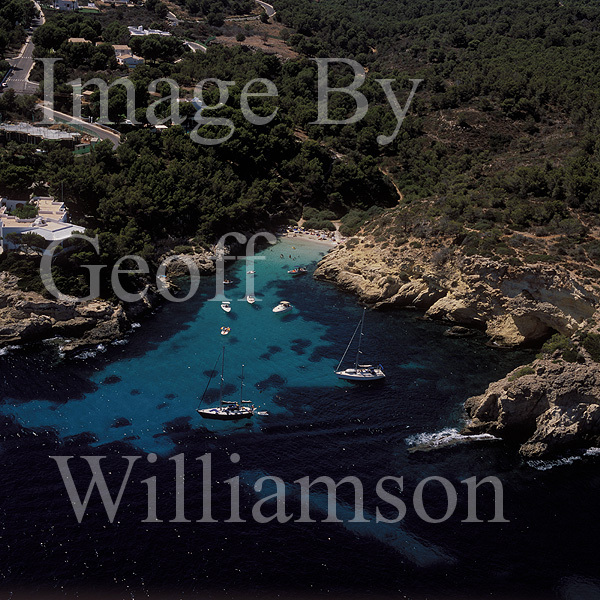 Cala Agulla - North of Cala Ratjada / Cala Rajada - a popular sandy beach and anchorage. 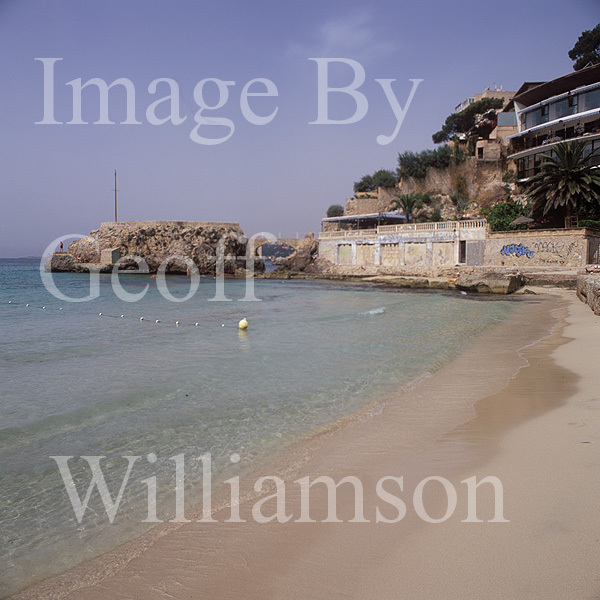 Small sandy Cala and beach North of Cala Ratjada / Cala Rajada. 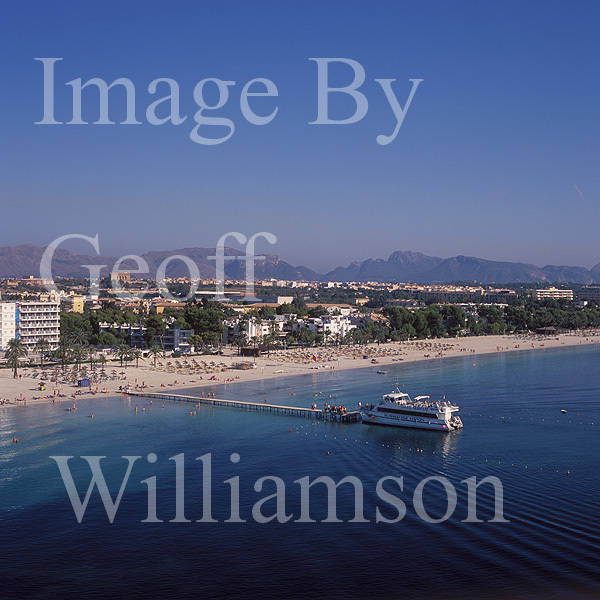 A popular small sandy beach and anchorage. 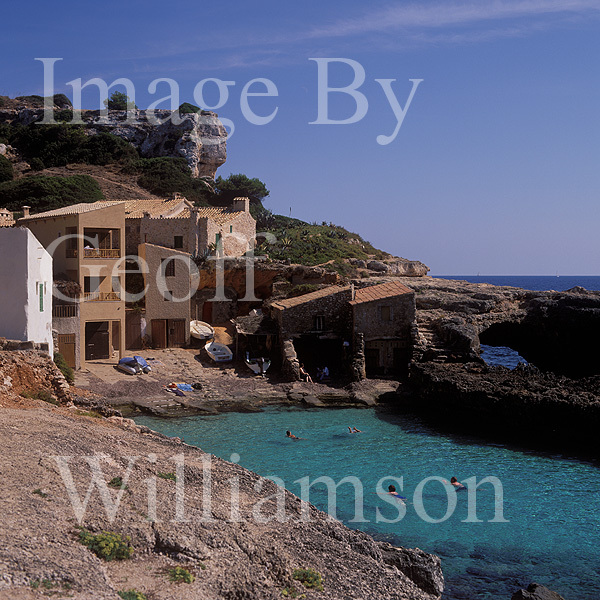 Cala Sa Nau ( Cala Sa Nou ). 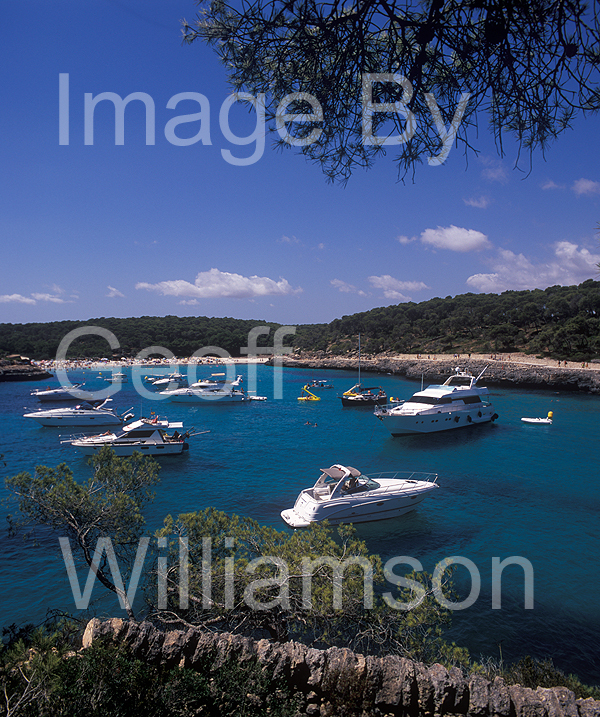 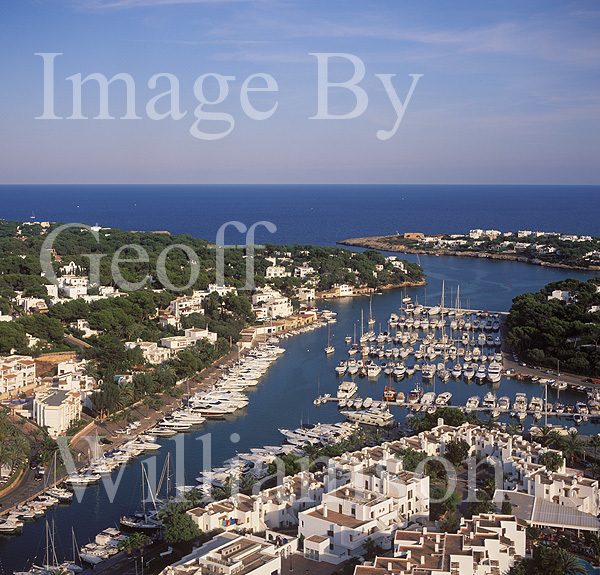 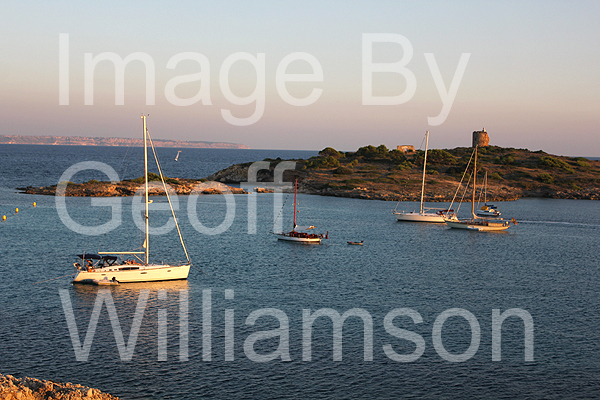 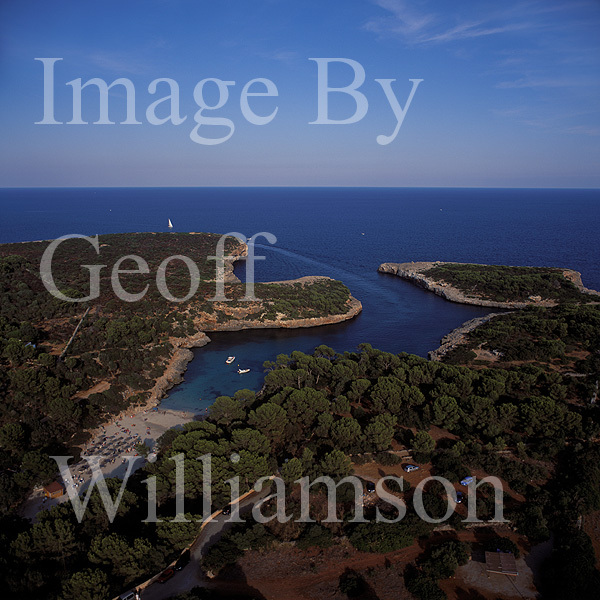 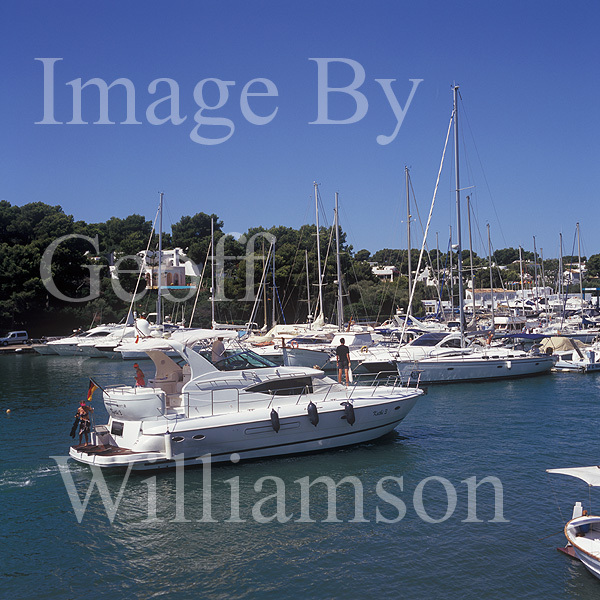 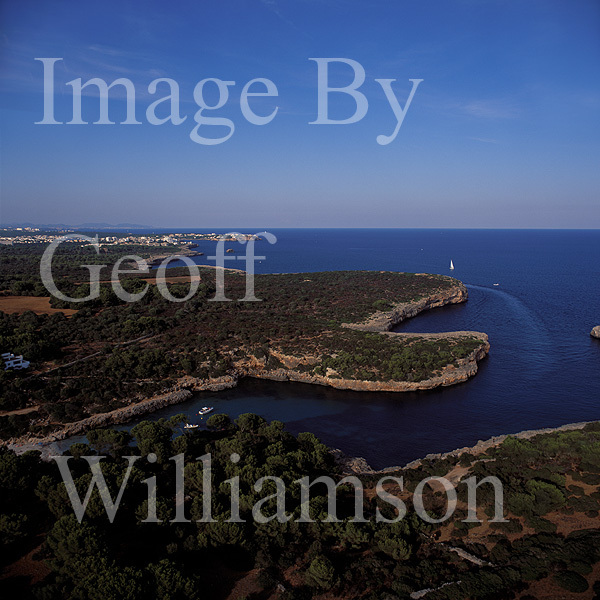 South of Porto Colom - a popular beach and well sheltered anchorage. 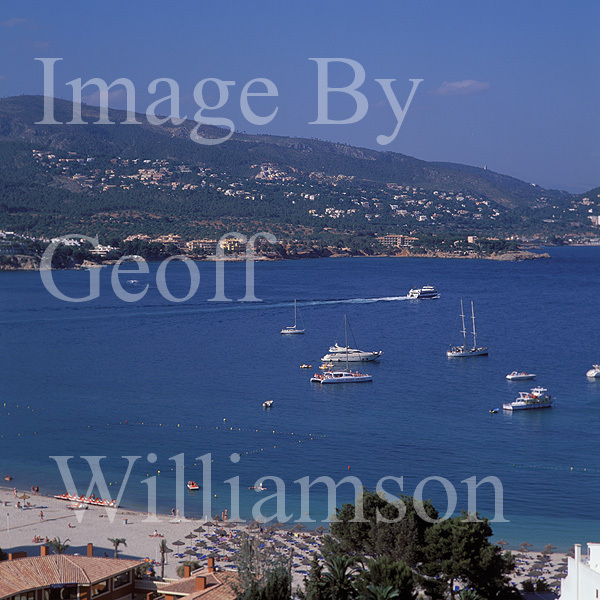 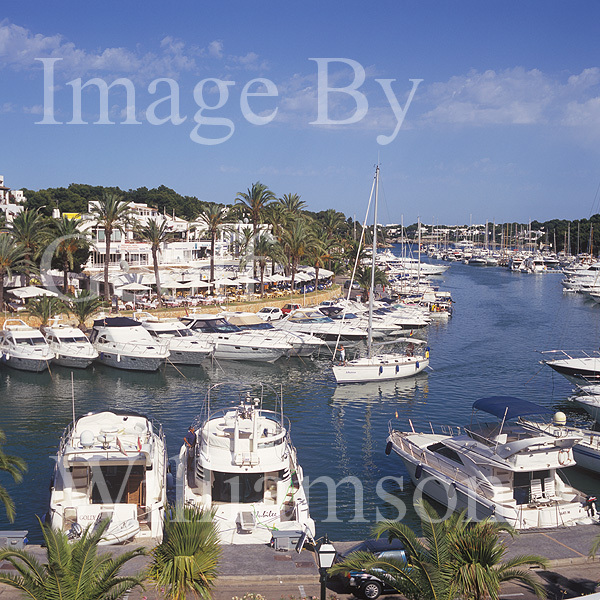 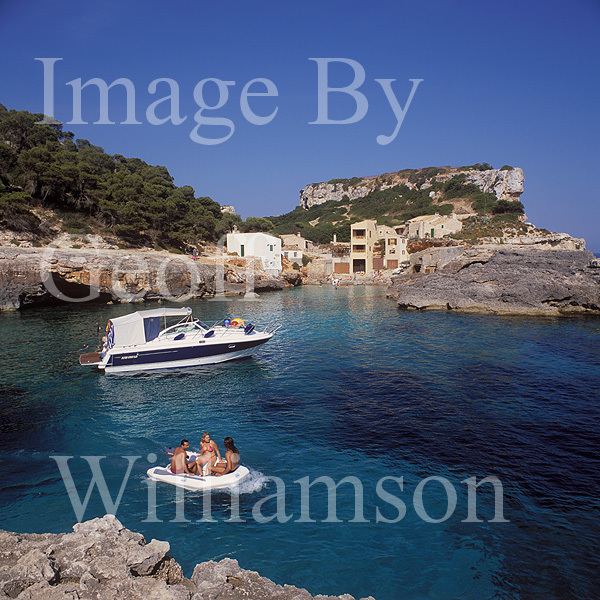 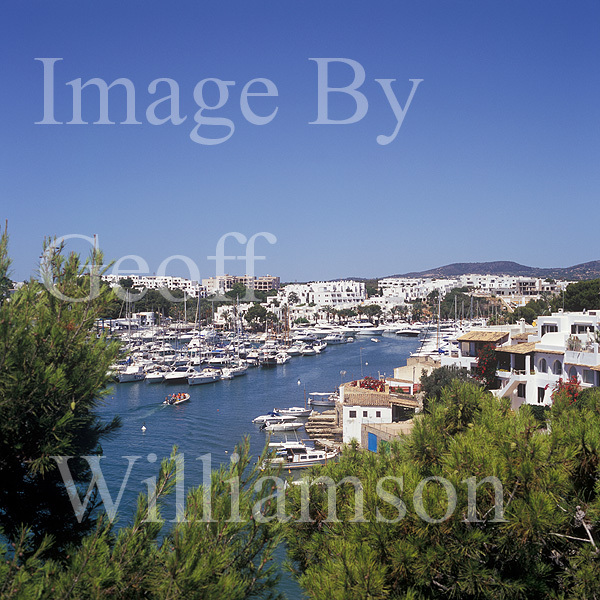 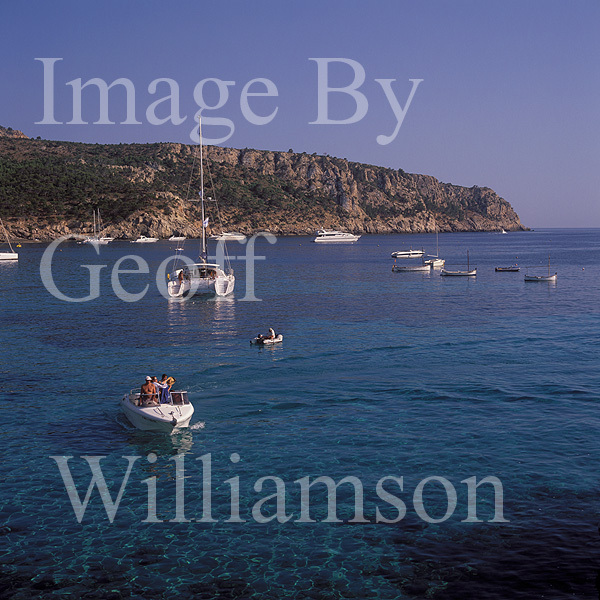 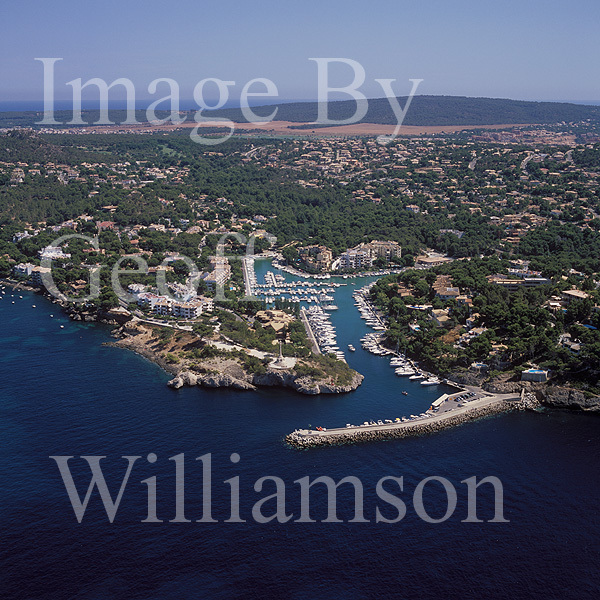 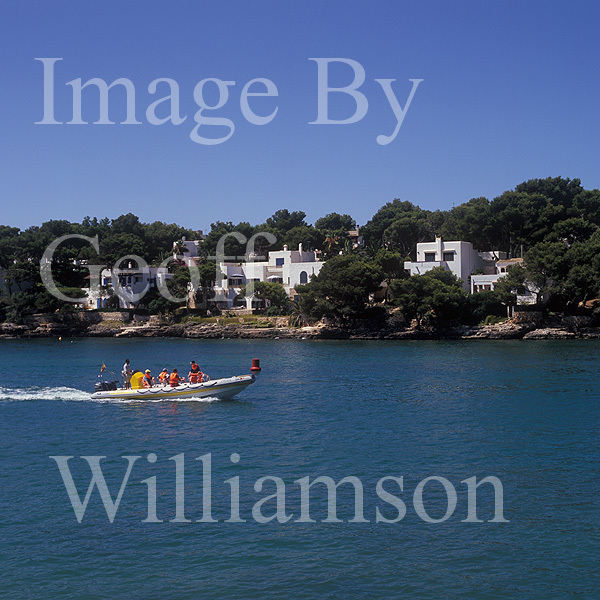 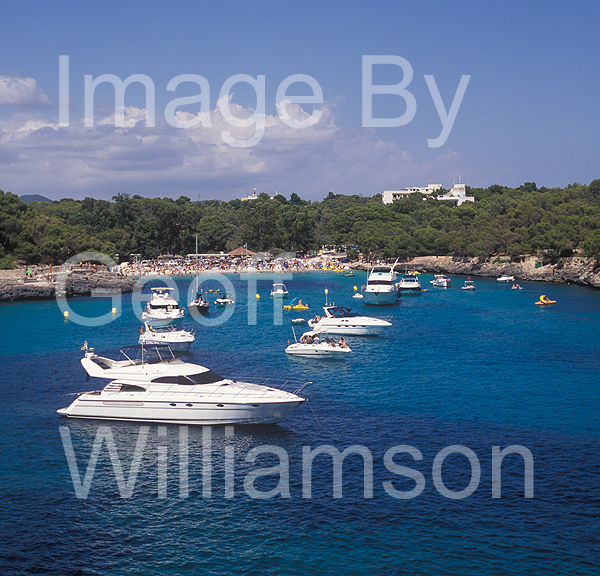 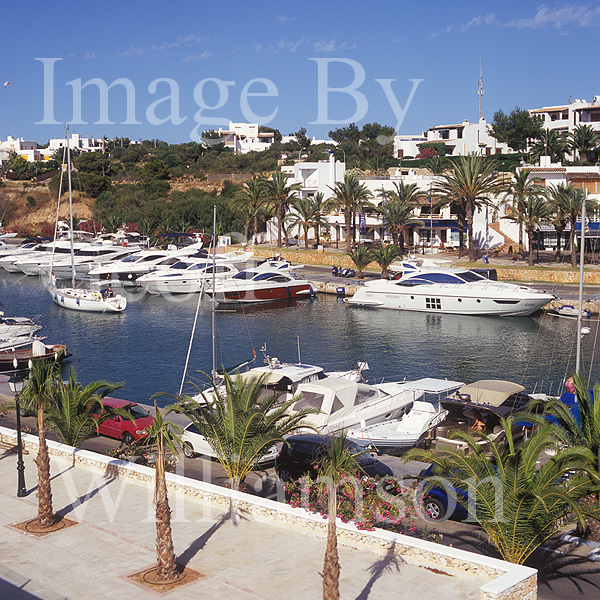 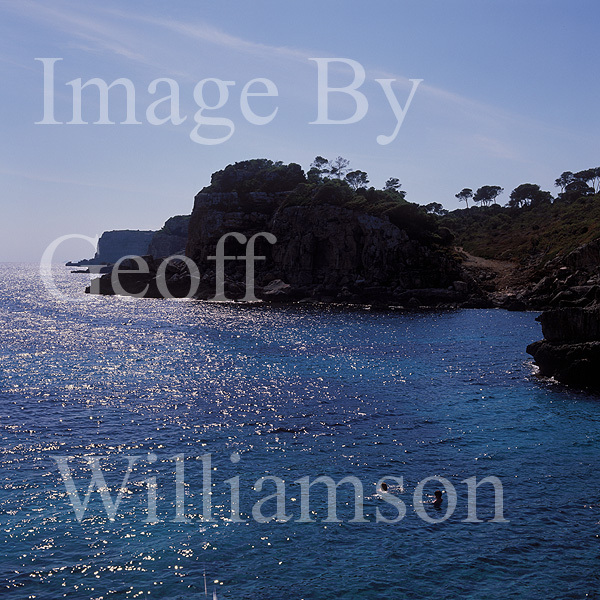 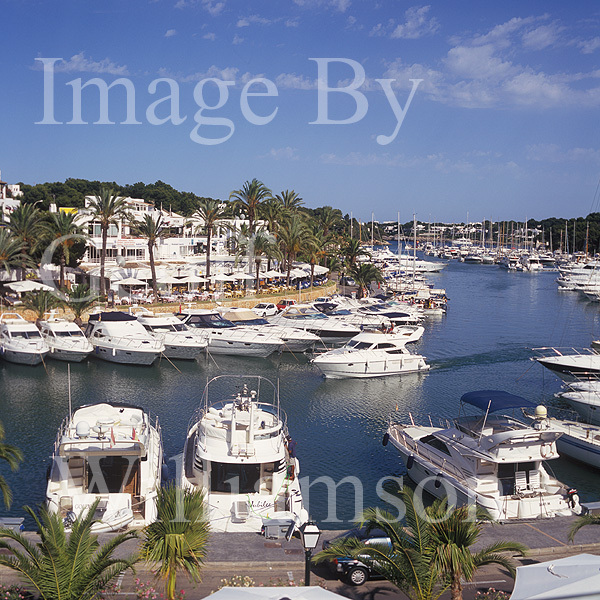 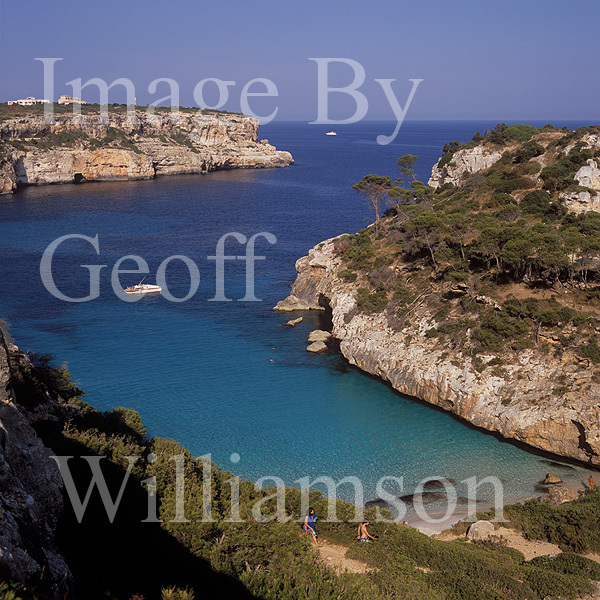 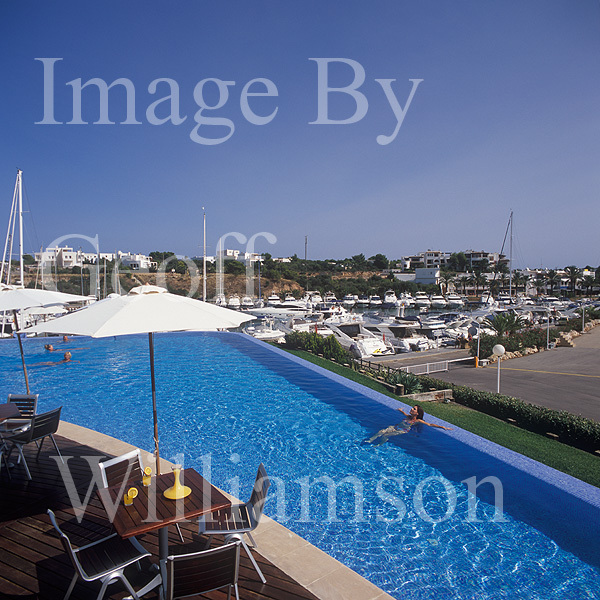 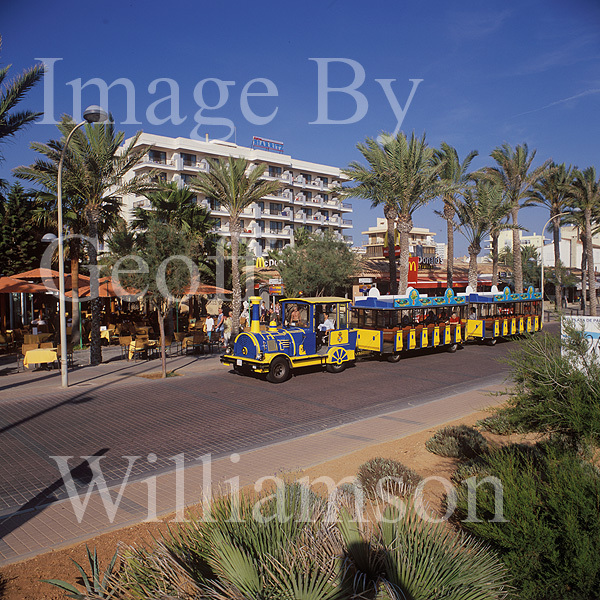 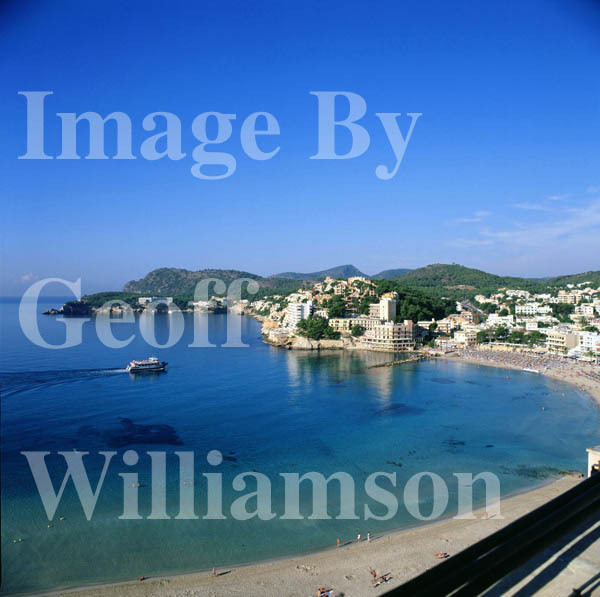 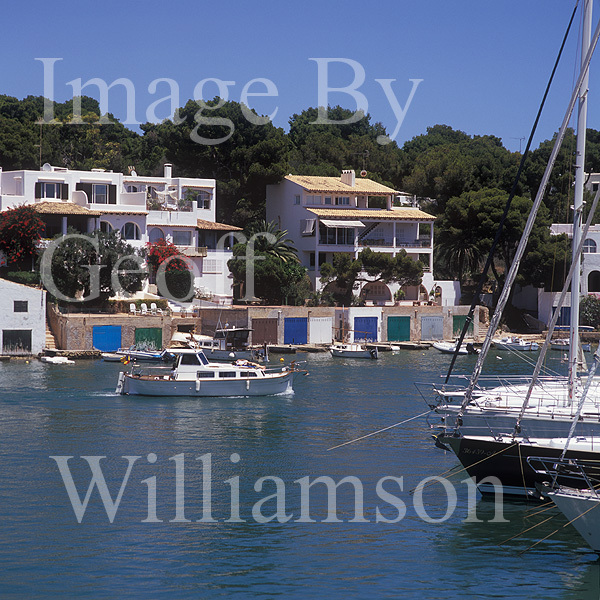 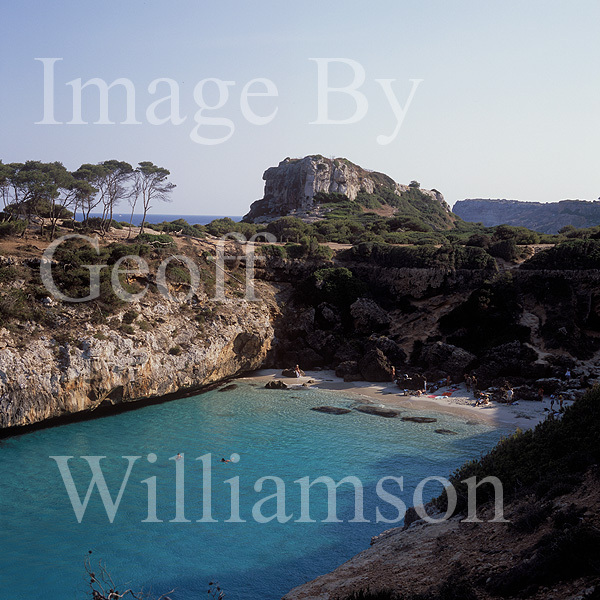 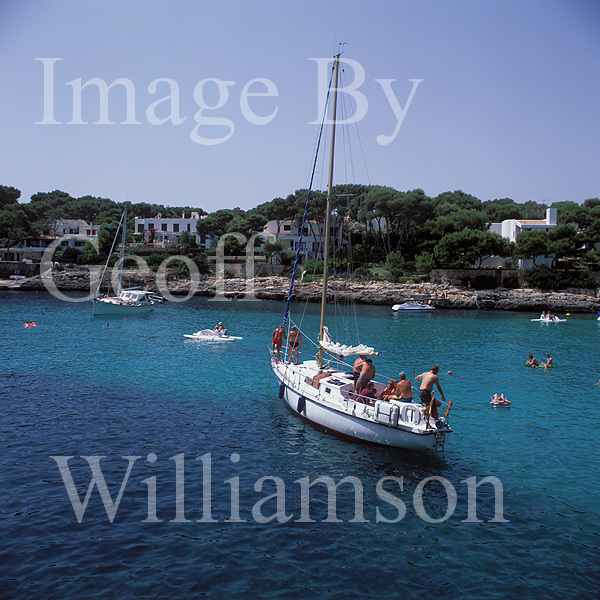 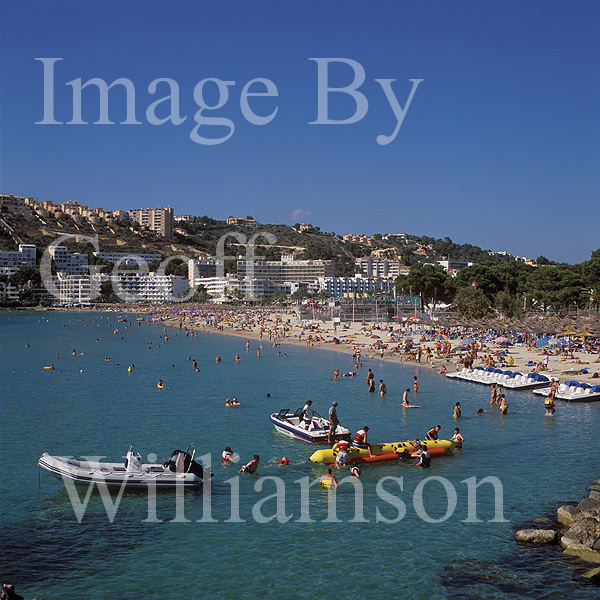 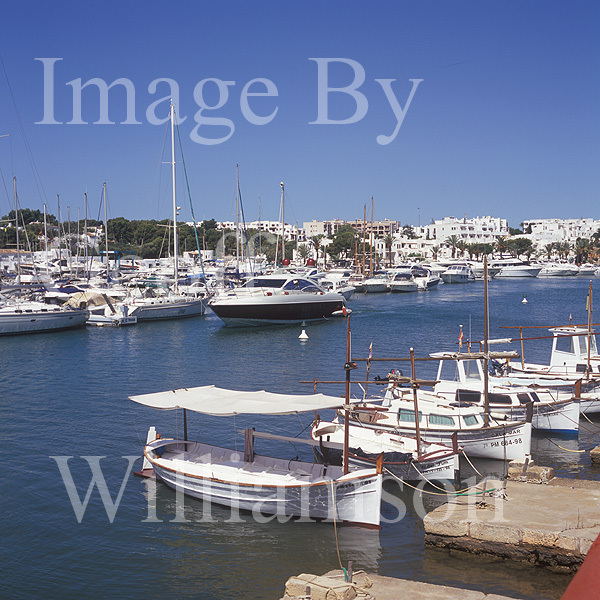 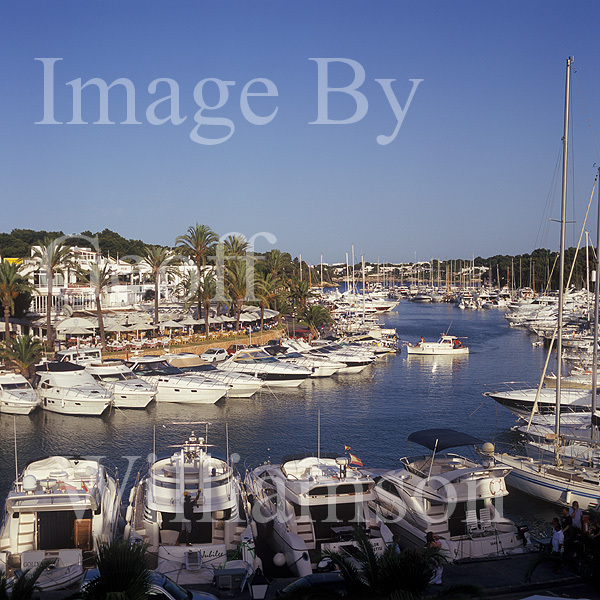 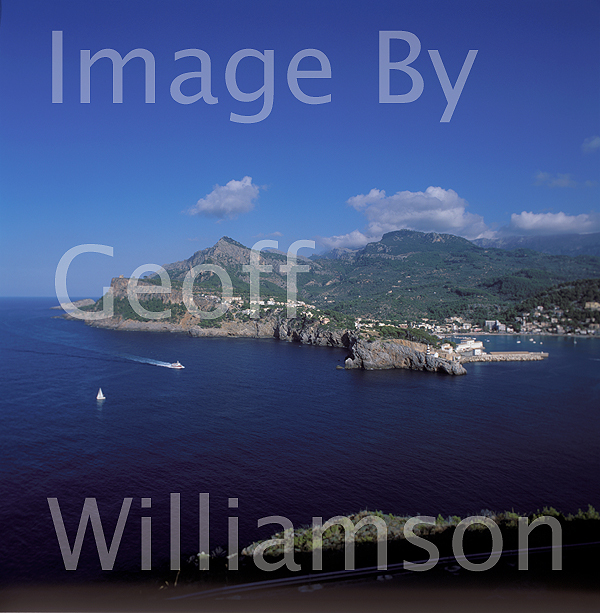 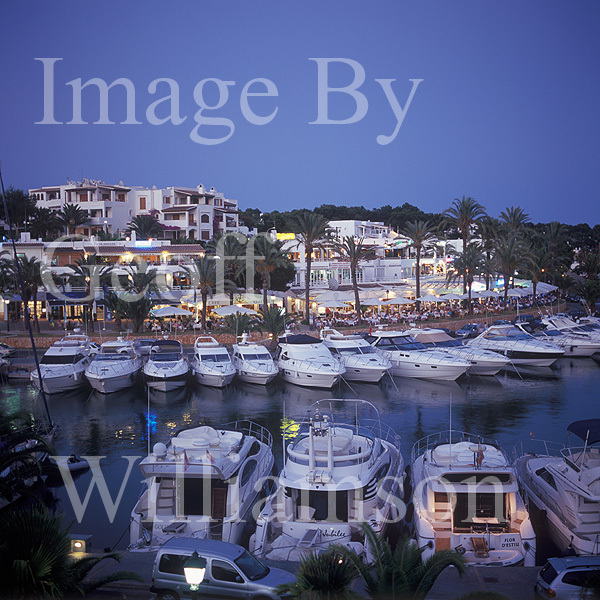 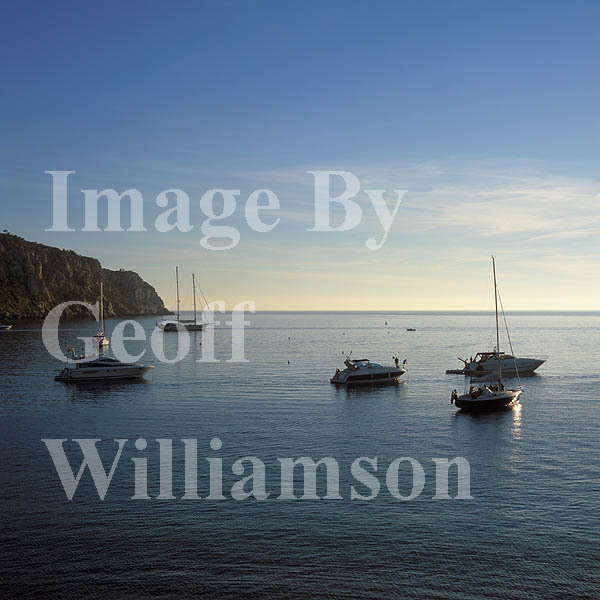 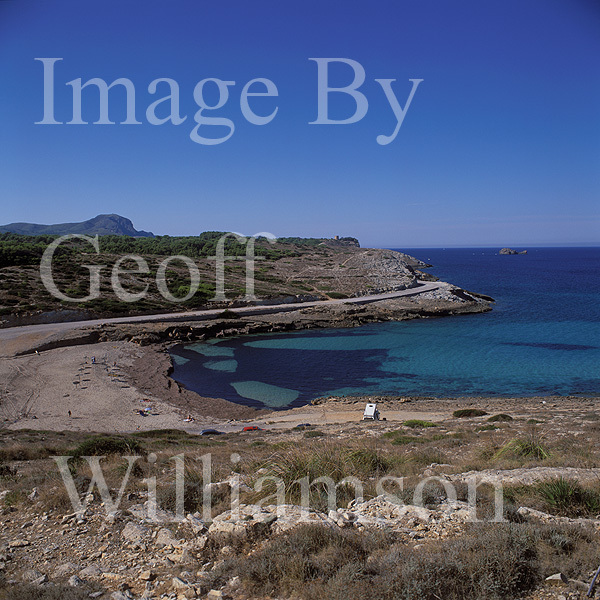 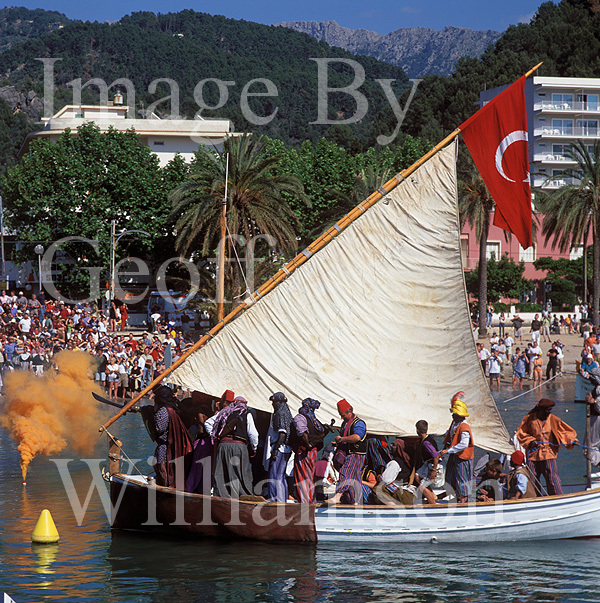 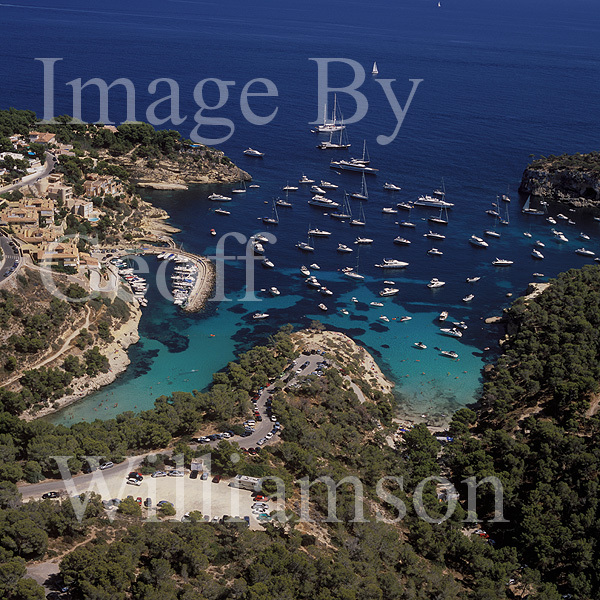 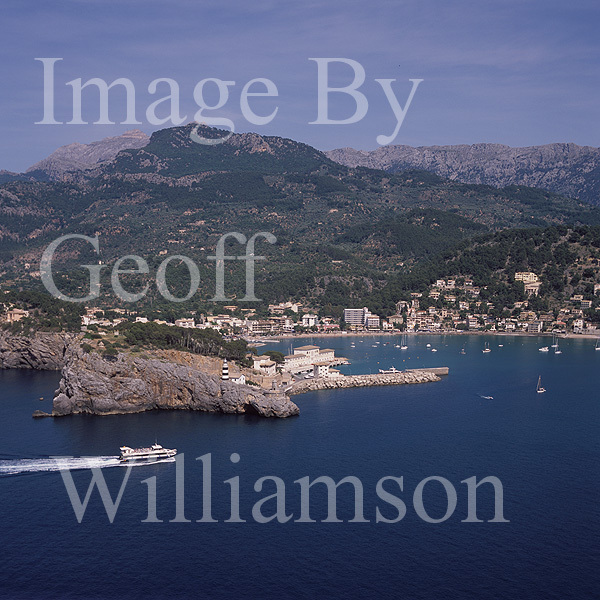 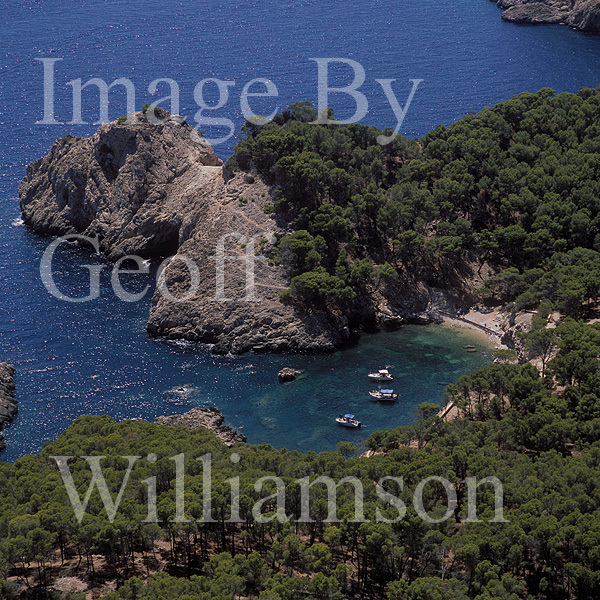 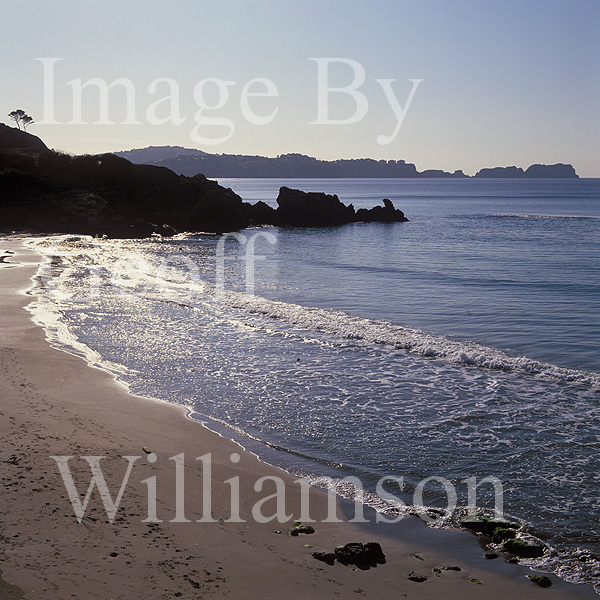 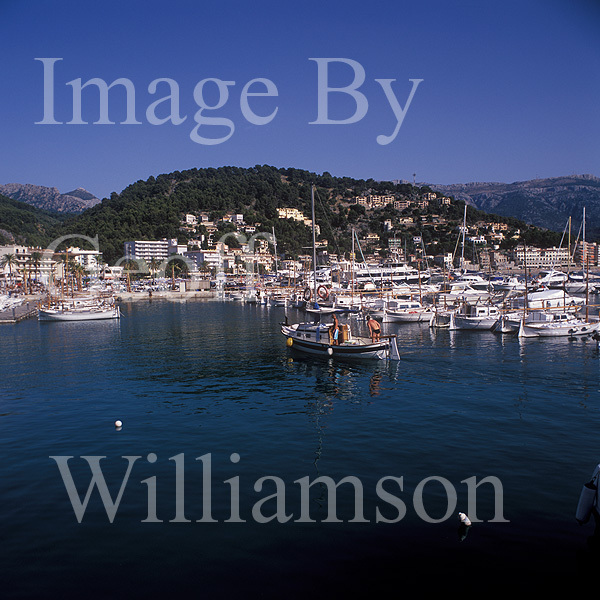 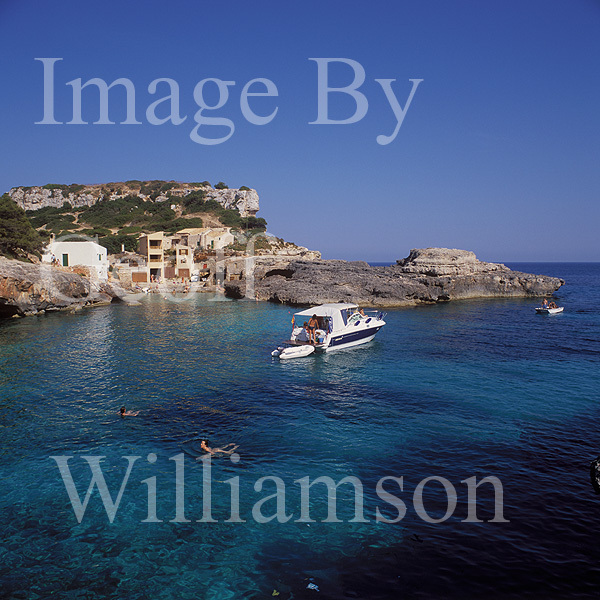 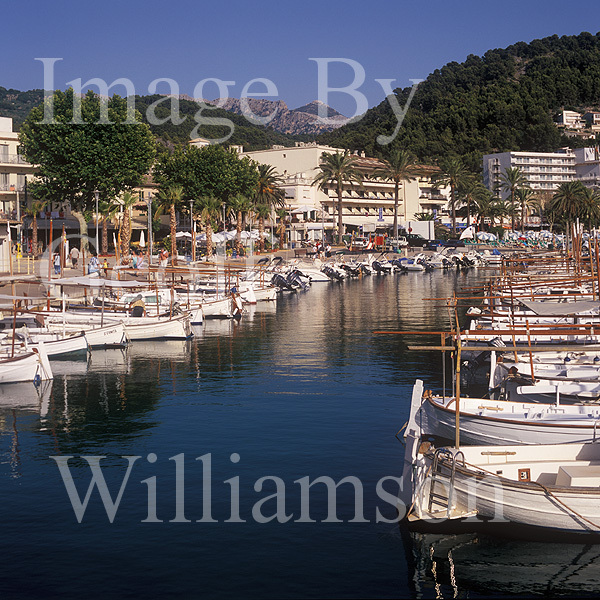 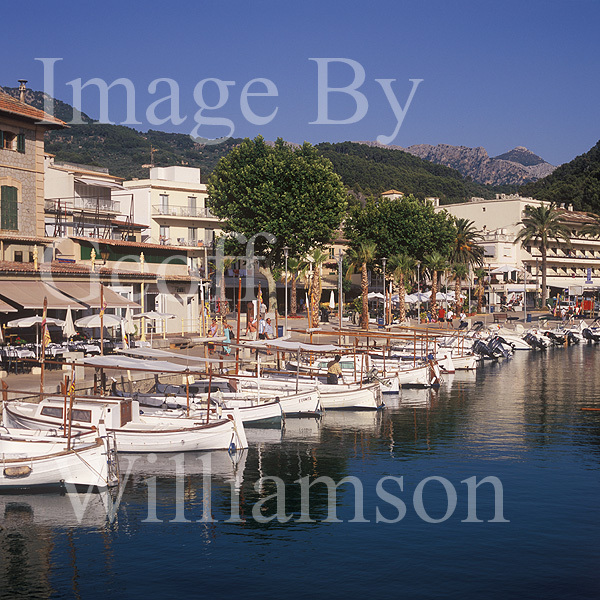 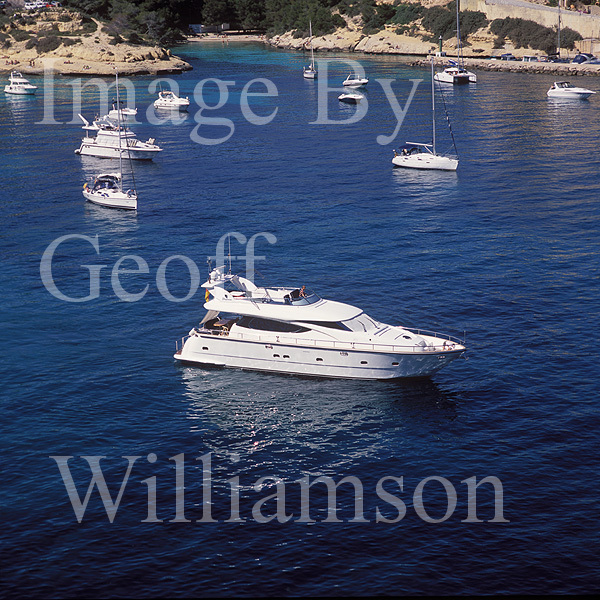 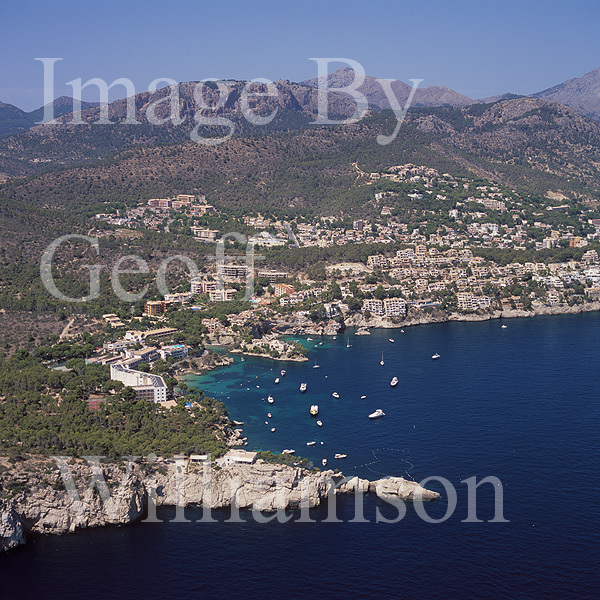 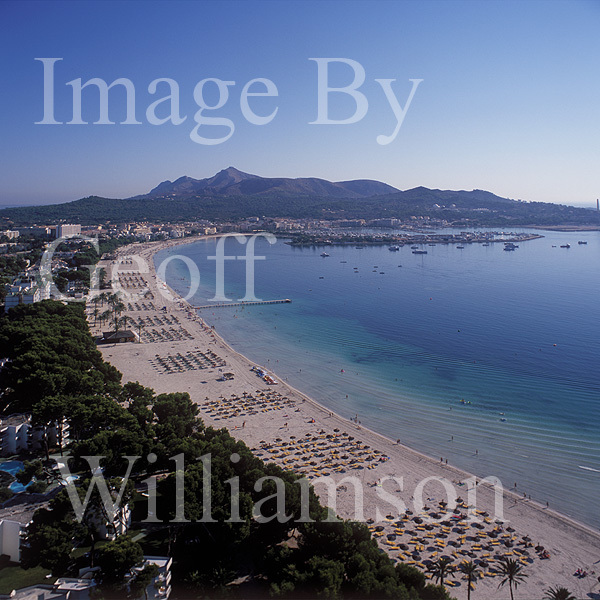 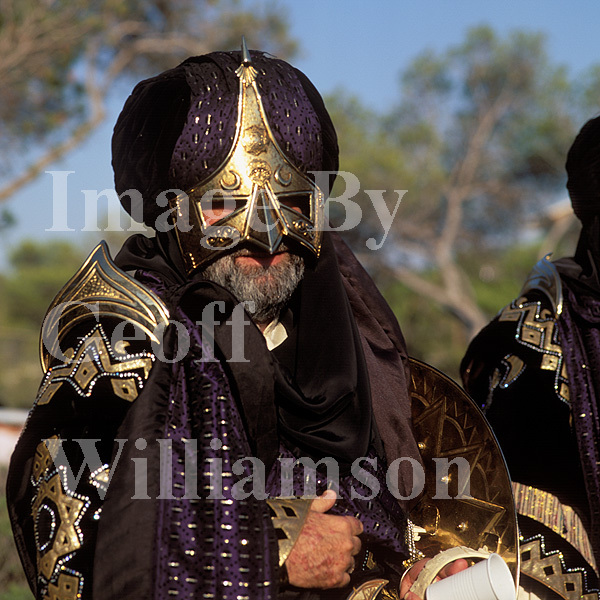 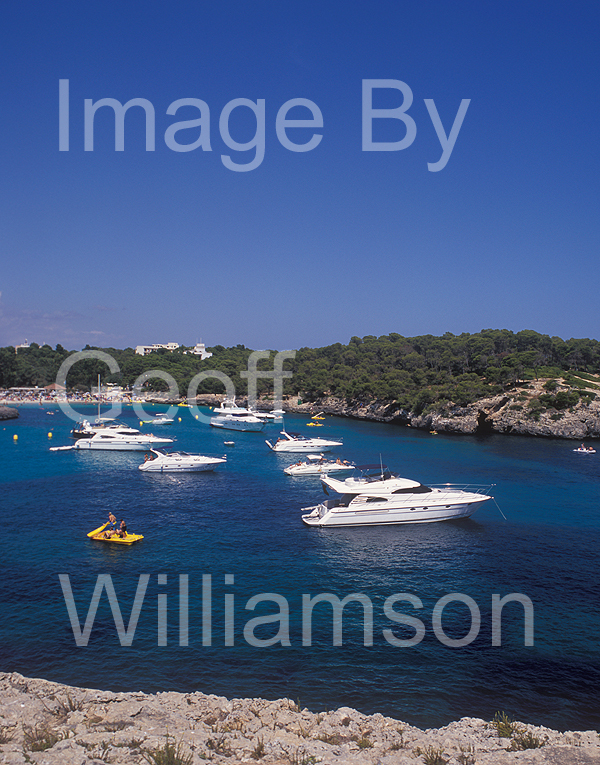 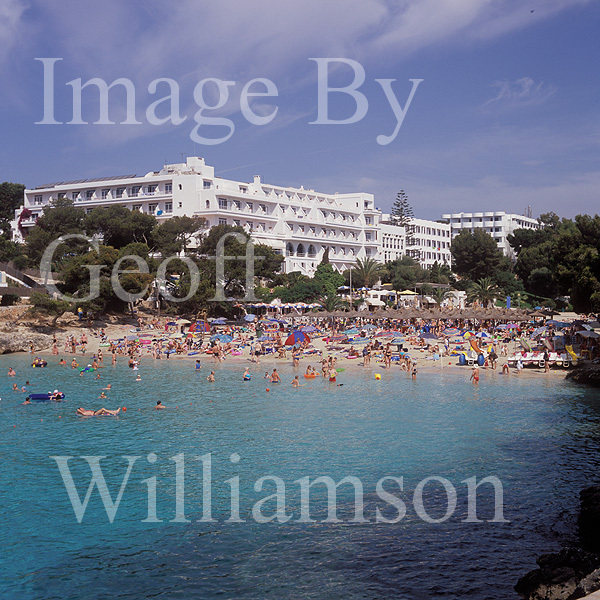 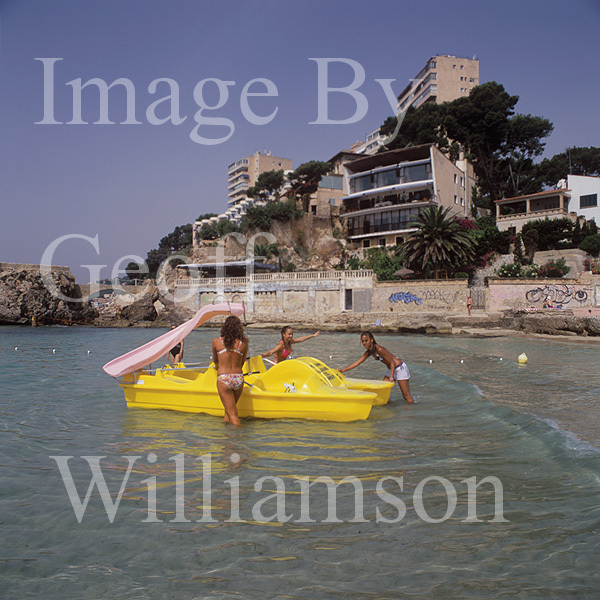 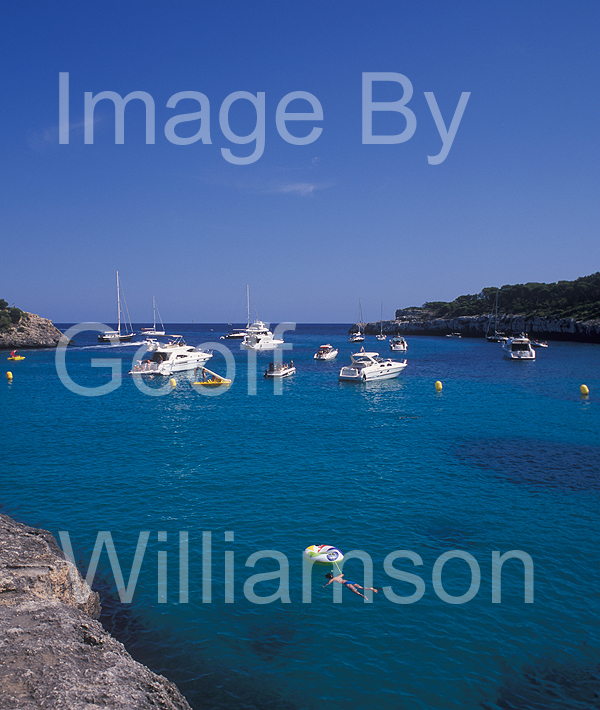 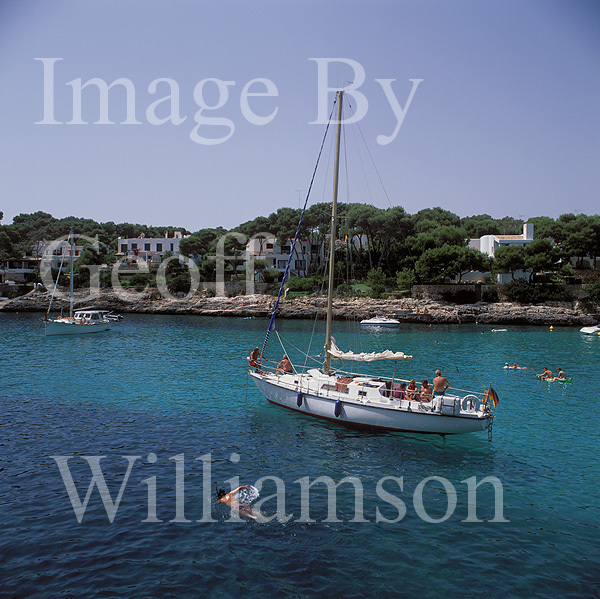 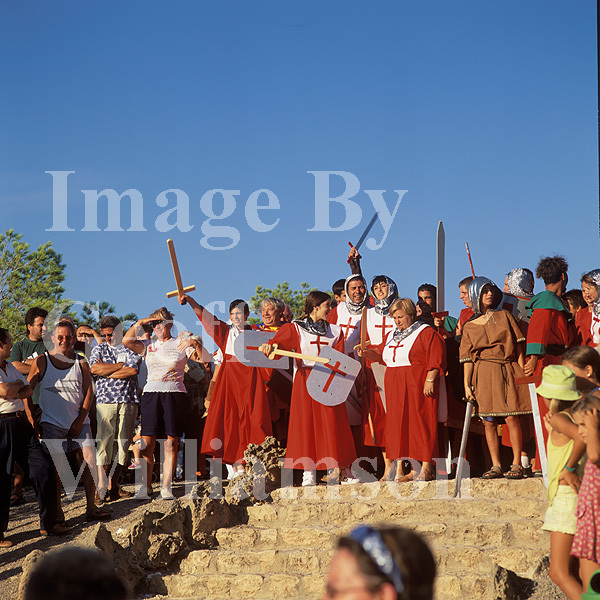 Images of Cala D'Or - an early Mallorcan tourist resort based on the numerous inlets ( calas ) with sandy beaches and quality hotels. 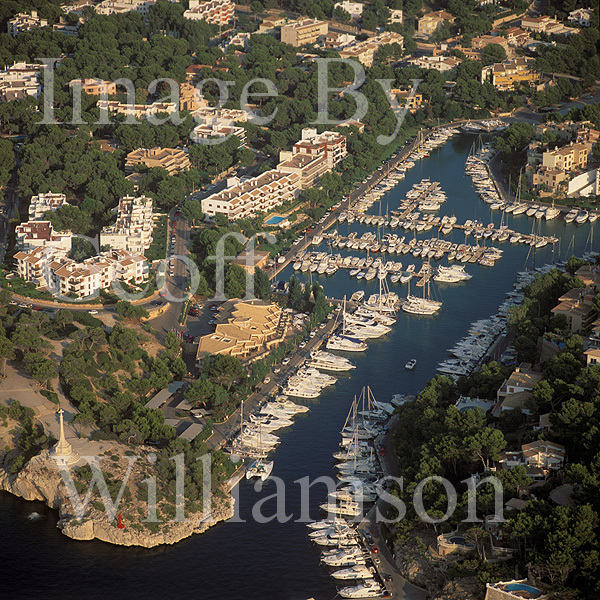 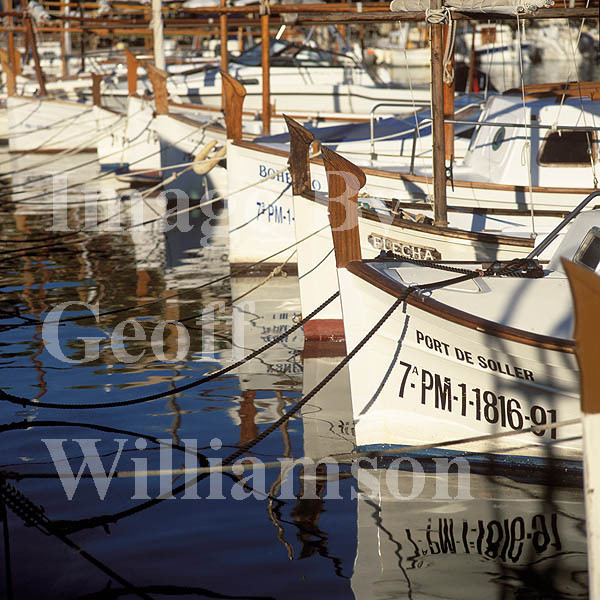 Now with a well sheltered Marina, overlooked by a elegant Yacht Club and well served by bars and fine restaurants. 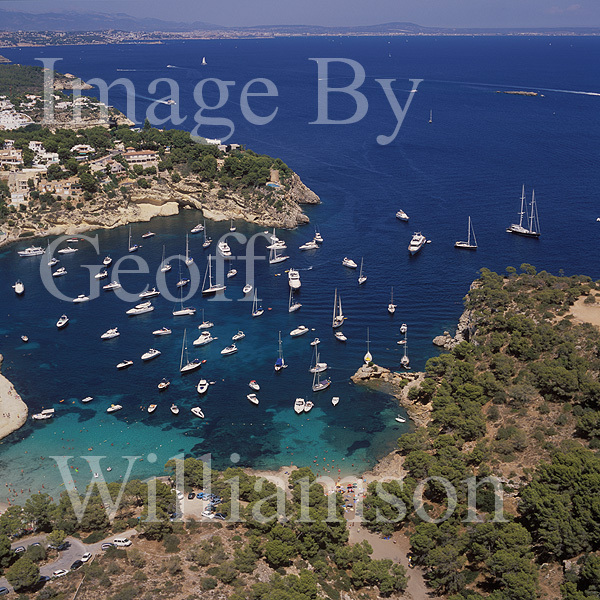 A short distance South of Cala D'Or - within a nature reserve - with sandy beaches one of which boasts a European Blue Flag - popular sheltered anchorages. 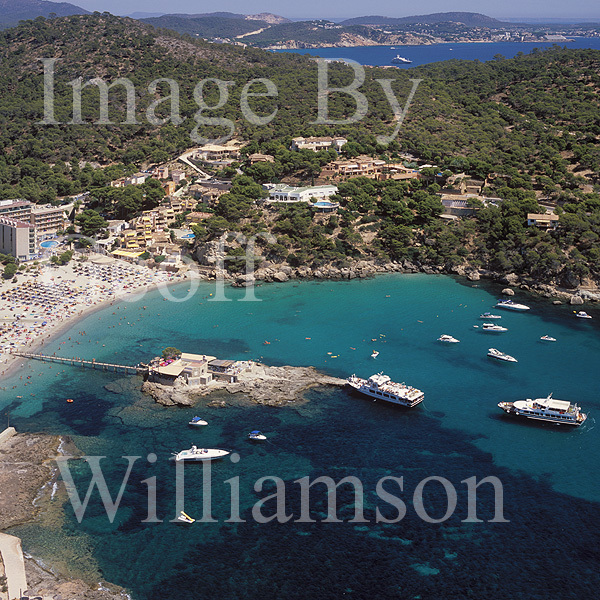 An attractive small bay with sandy beach - beach side bars and restaurants. 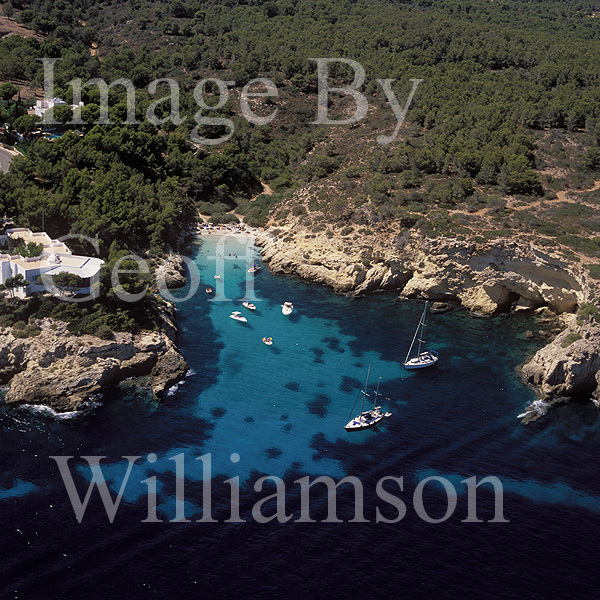 Adjacent to Cala Santanyi - sandy safe beach and bay . 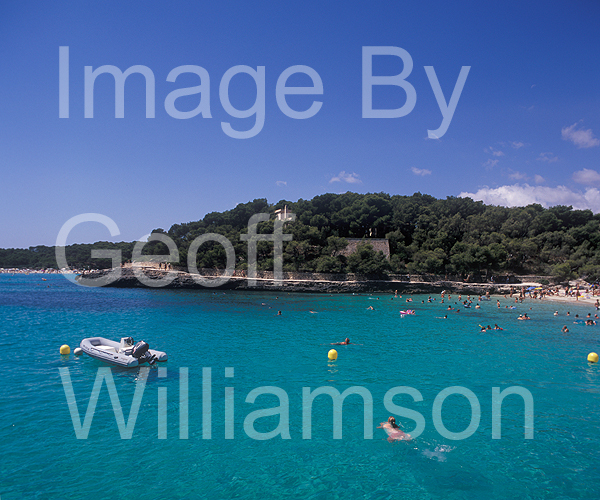 One of the most beautiful bays and beaches in Mallorca. 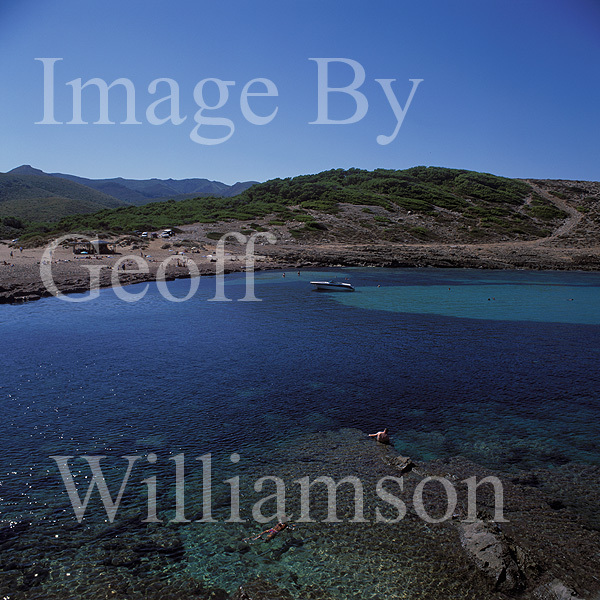 Somewhat of a scramble to reach on foot. 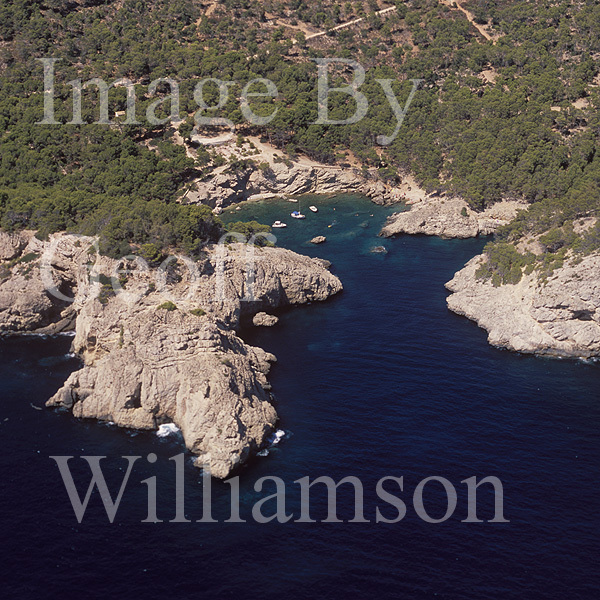 Cala S'Almunia and Cala Es Moquer. 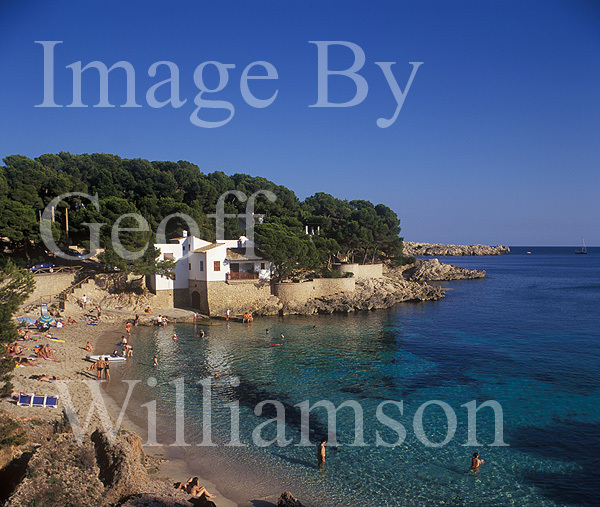 Adjacent pictureque calas - popular small beaches and bays - popular with swimmers and sunbathers - a popular anchorage. 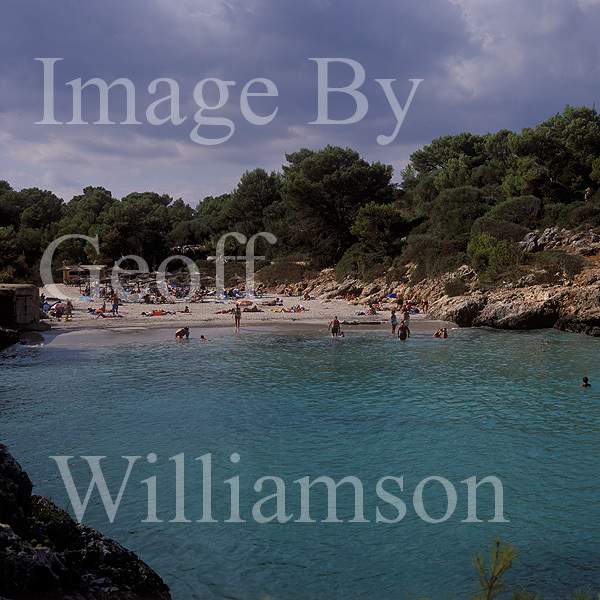 Platja Des Dolc / Playa Des Dols / Des Dols Beach. 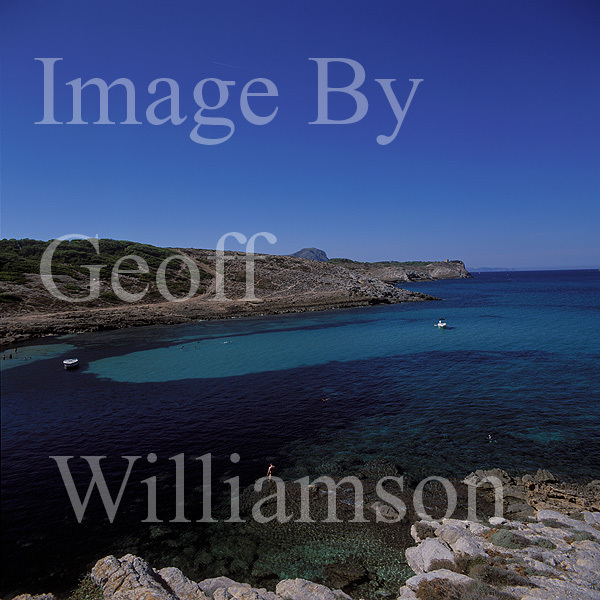 Reached on foot around the bay Eastwards from Colonia Sant Jordi. 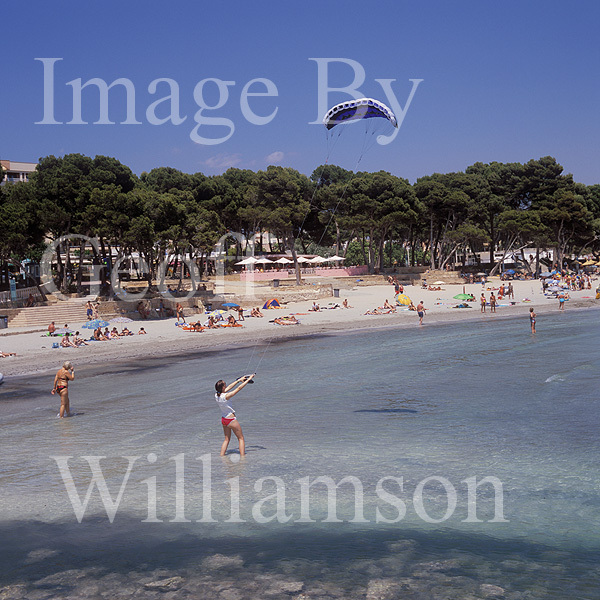 Es Trenc Beach / Platja Es Trenc / Playa Es Trenc. 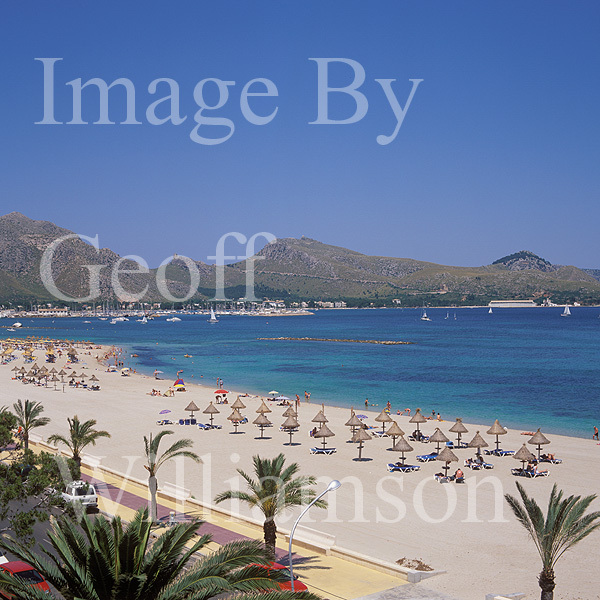 Sun, Sea and Sand on Es Trenc Beach - probably the most famous beach in Mallorca - a magnet for boats, sun worshippers, fitness and yoga enthusiasts. 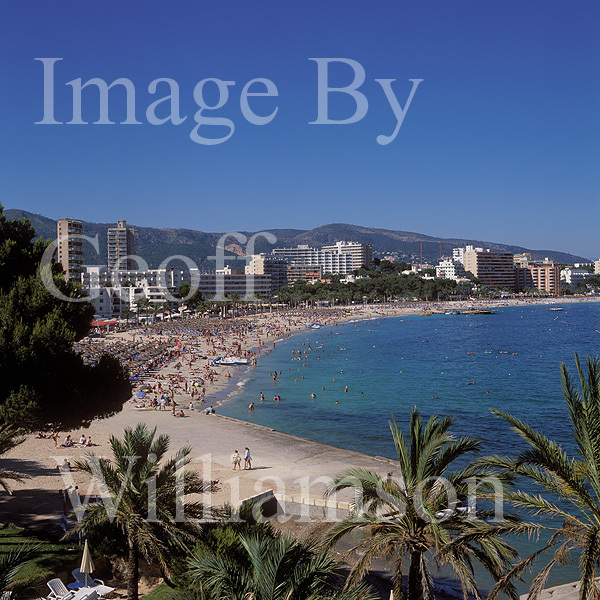 Playa de Palma / Platja den Arenal. 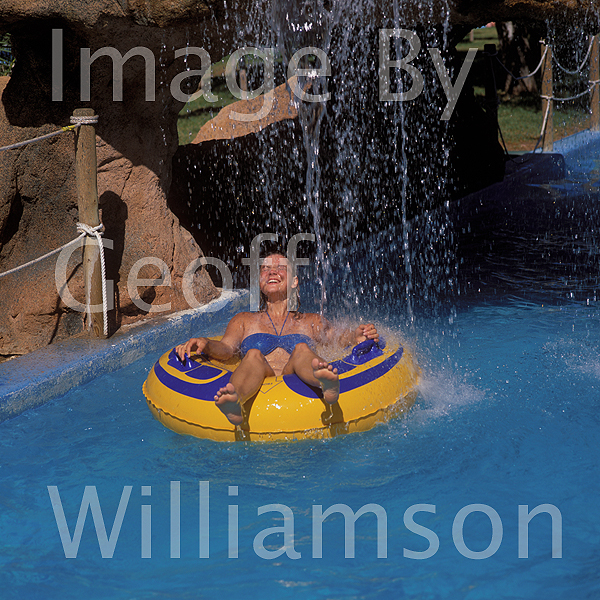 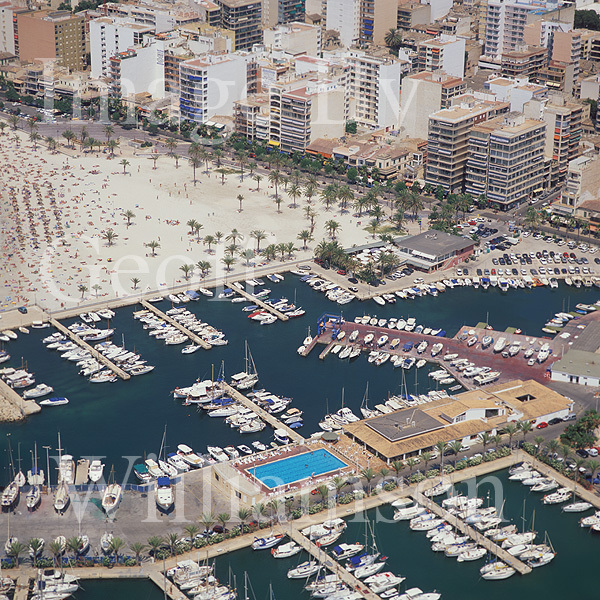 Beach resort with long sandy beach, a marina and nearby major water park. 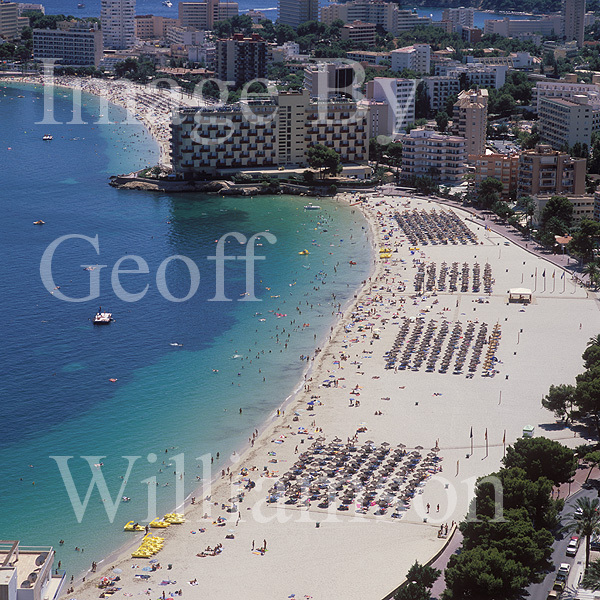 Sandy beach a short distance westwards from Palma. 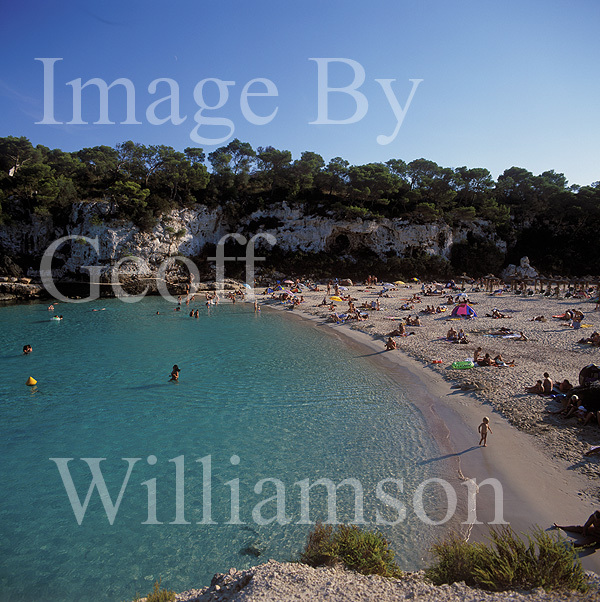 Some small sandy beaches, also with sunbathing and swimming off rocks. 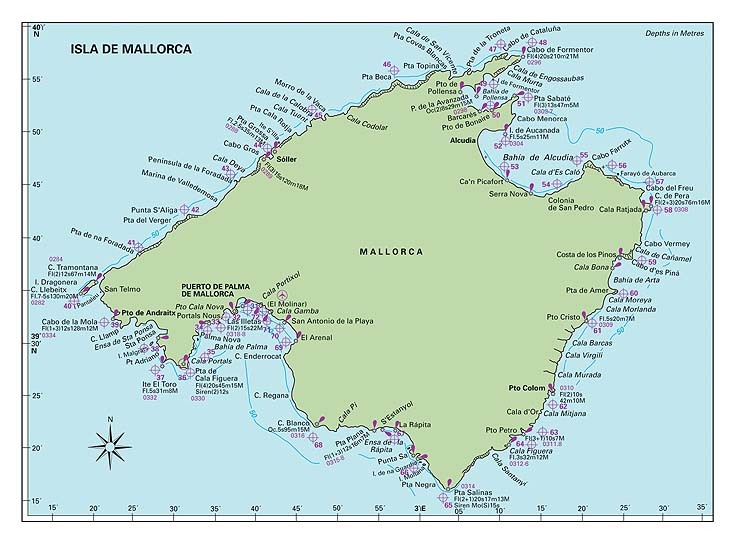 Anchorages and beaches at Bendinat - West of Puerto Portals. 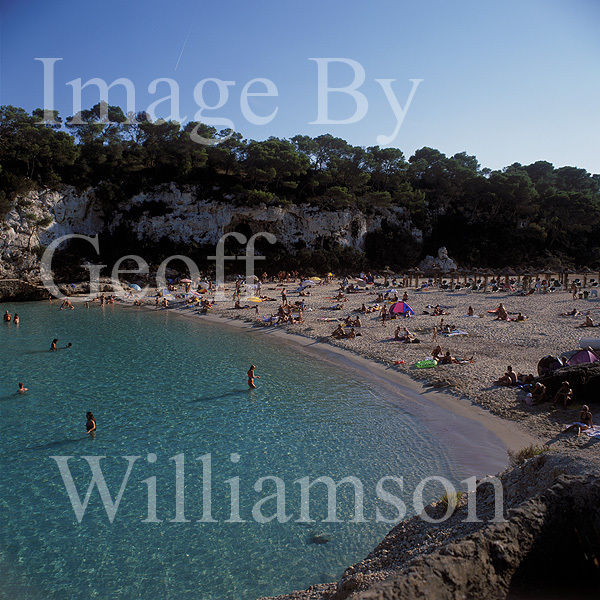 Portals Nous beach adjacent to Puerto Portals. 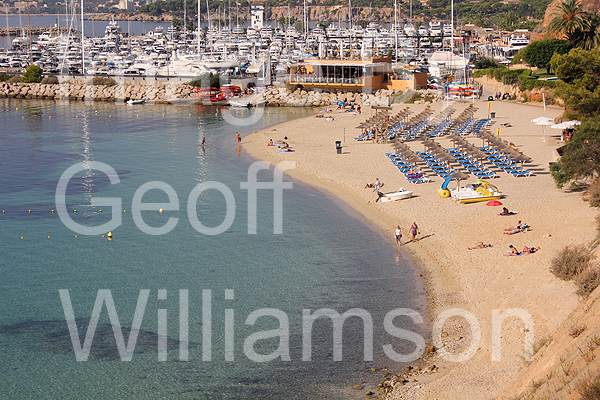 Excellent sandy beaches with water sports and boat trips available. 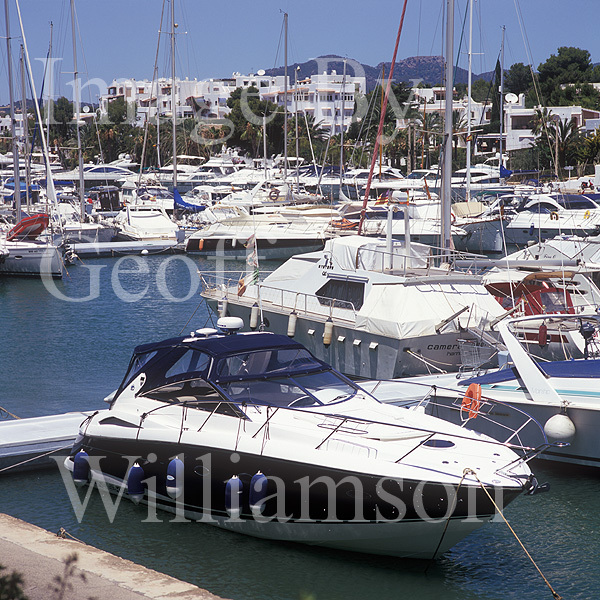 Popular anchorage. 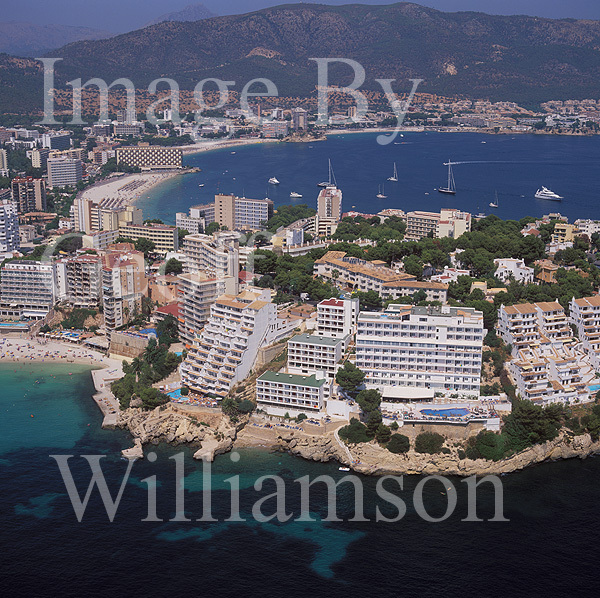 Separated from Magalluf to West by the Torre Nova peninsular ( lower LHS image). 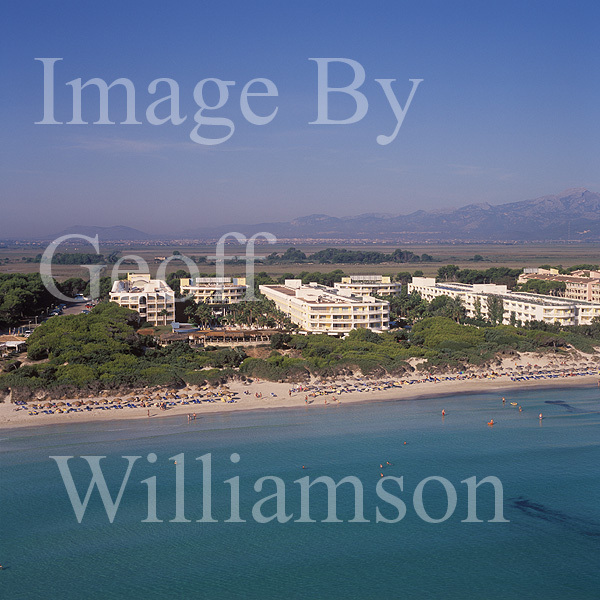 Long sandy beach with water sports and boat trips available - nearby water park. 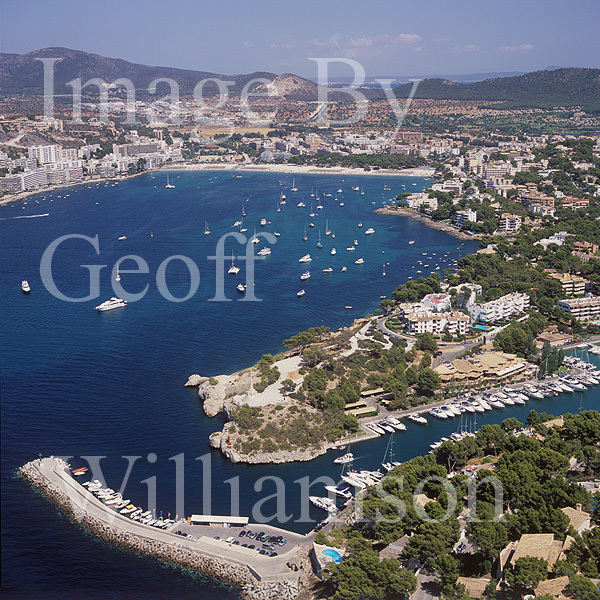 Popular anchorage. 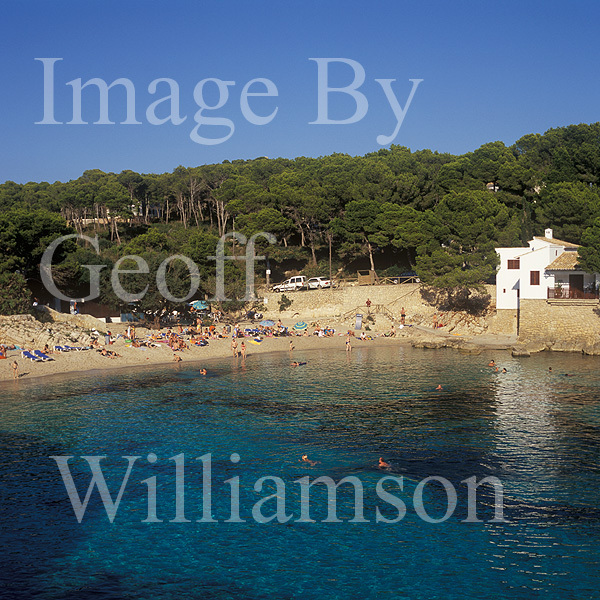 Cala Falco / Falco Beach. 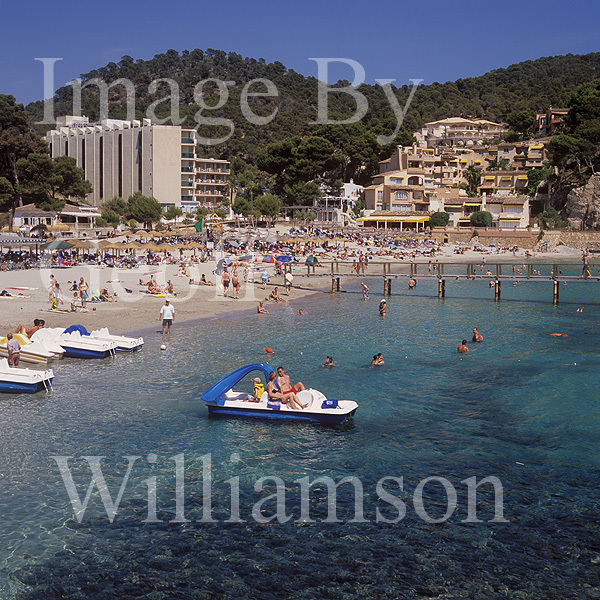 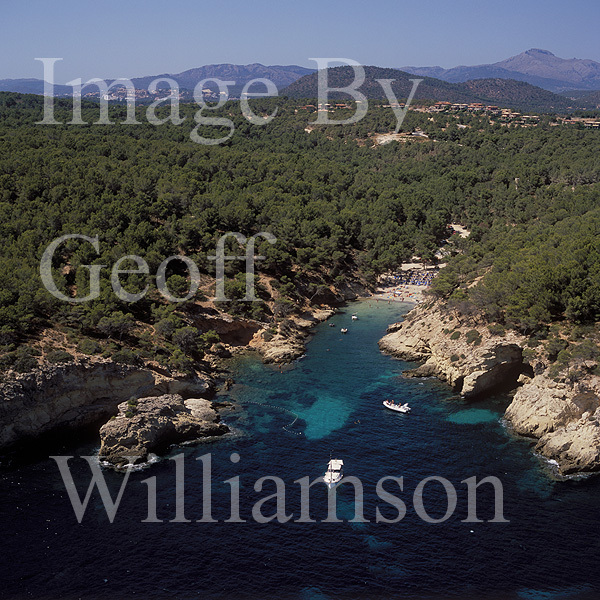 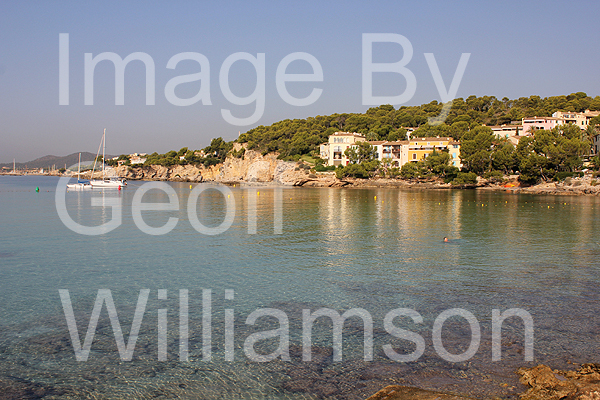 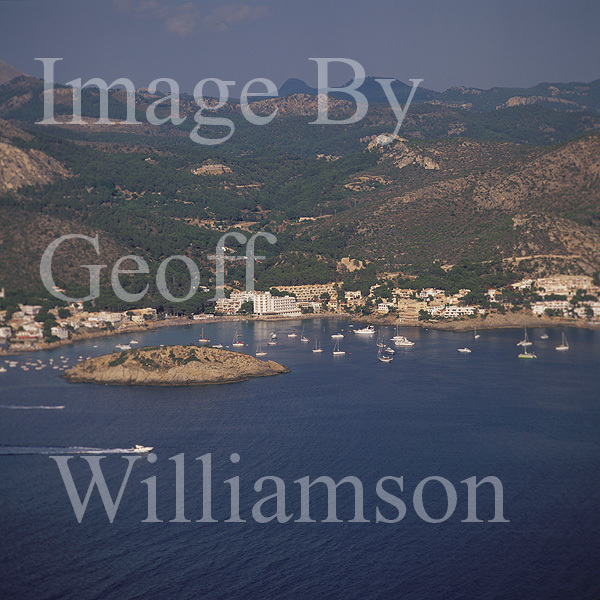 Small popular sandy beach and anchorage west of Cala Vinas / Cala Vinyes. 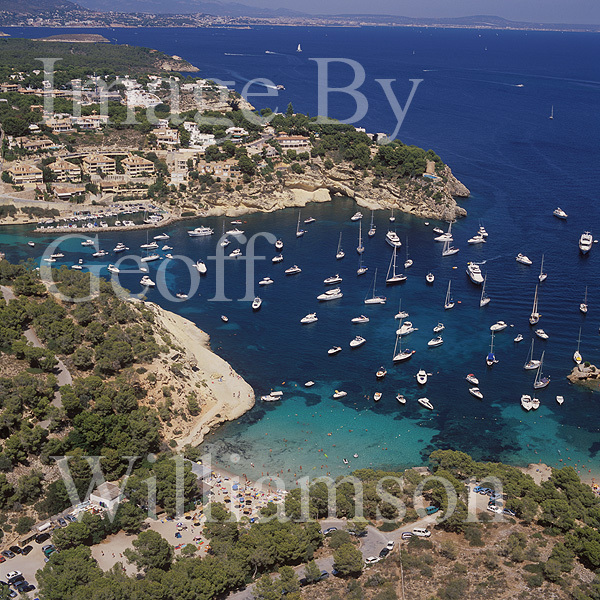 Small sandy beach and popular anchorage in the Sol de Mallorca. 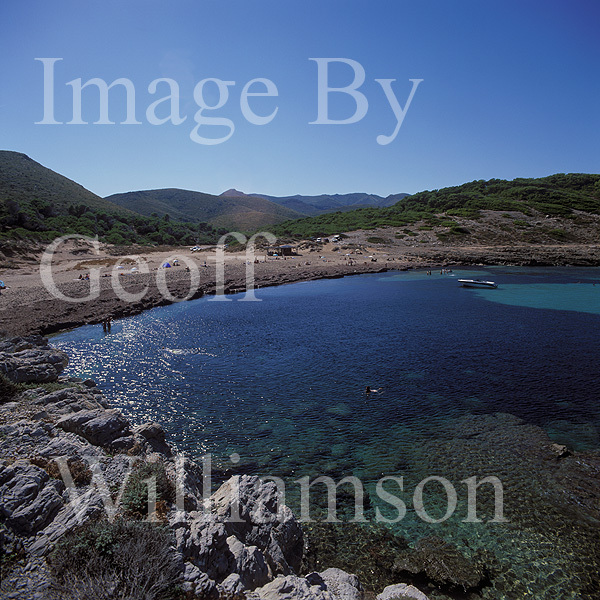 Cala Portals / Portals Vells. 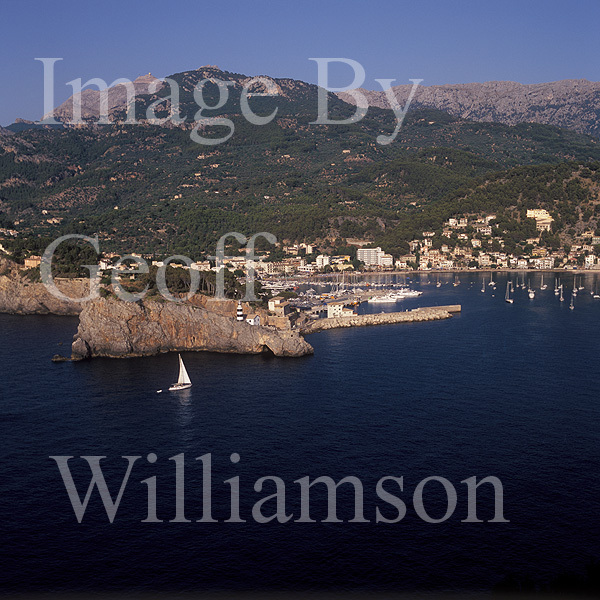 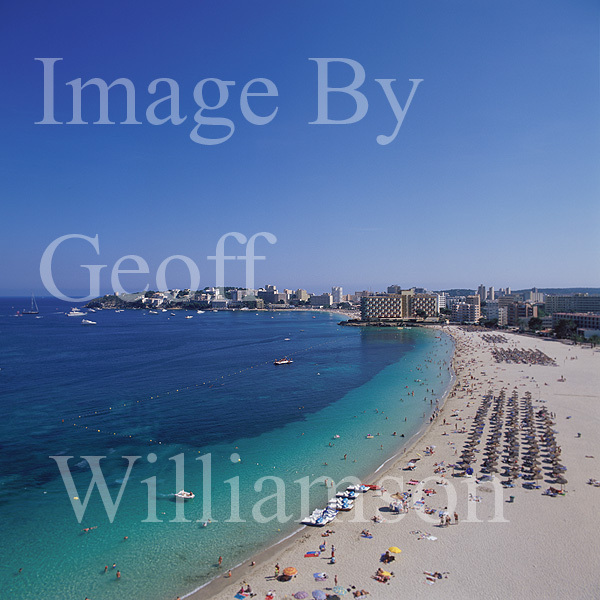 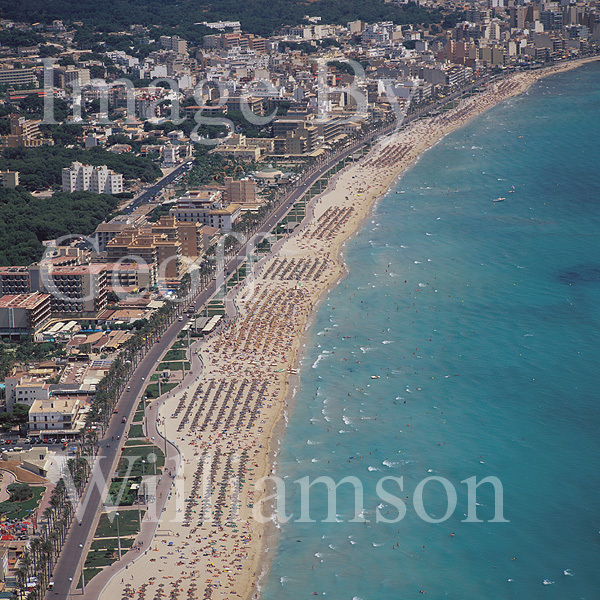 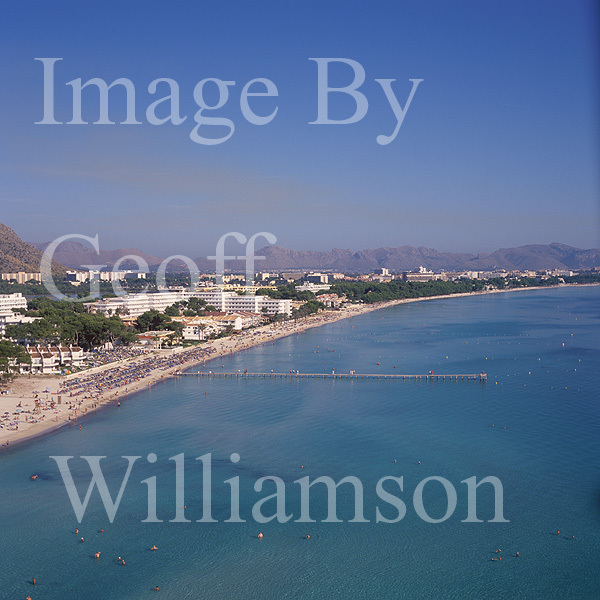 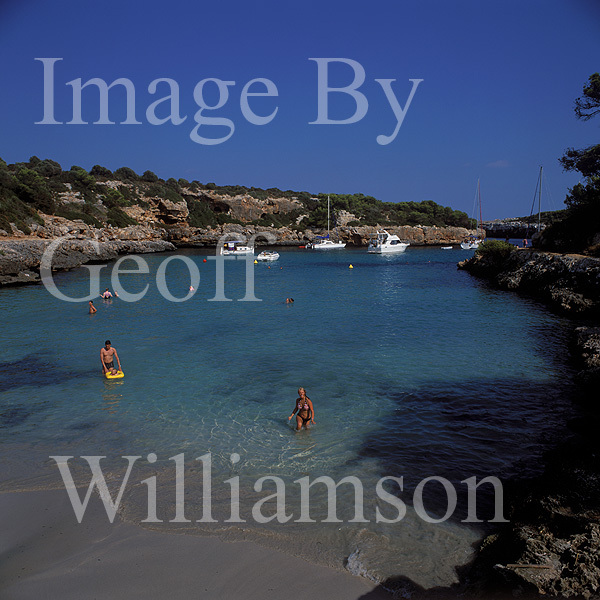 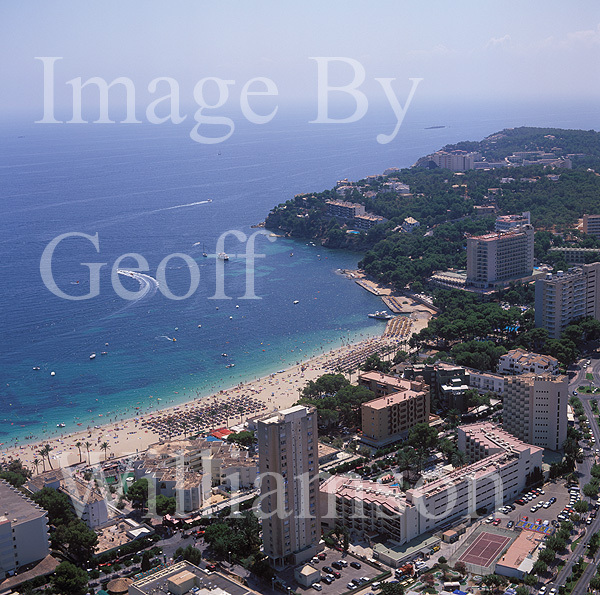 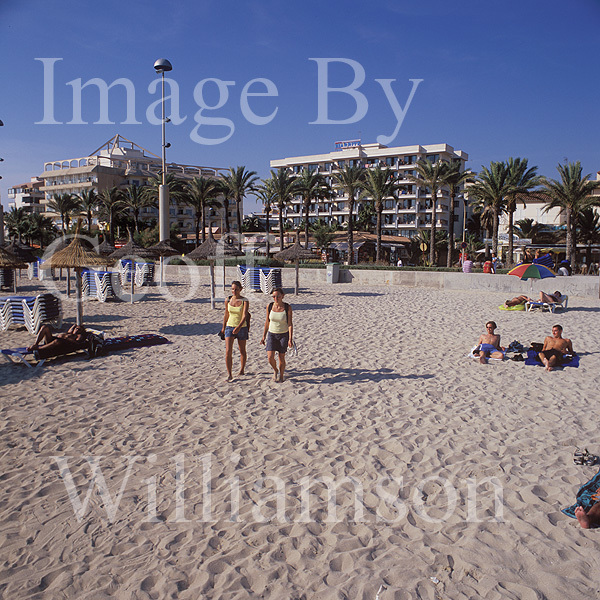 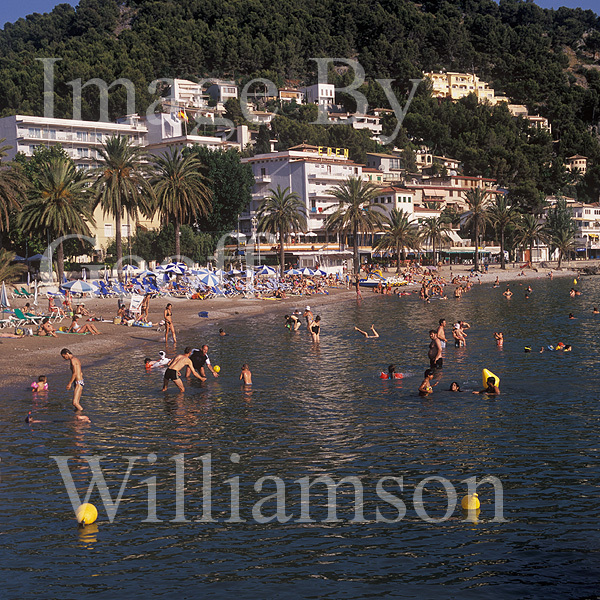 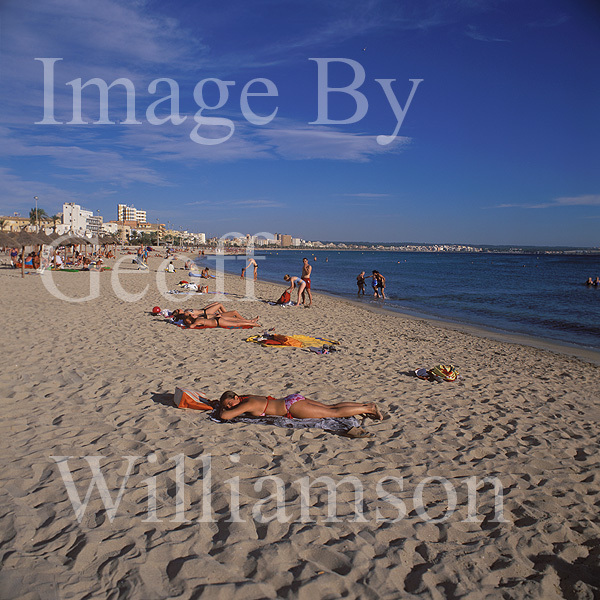 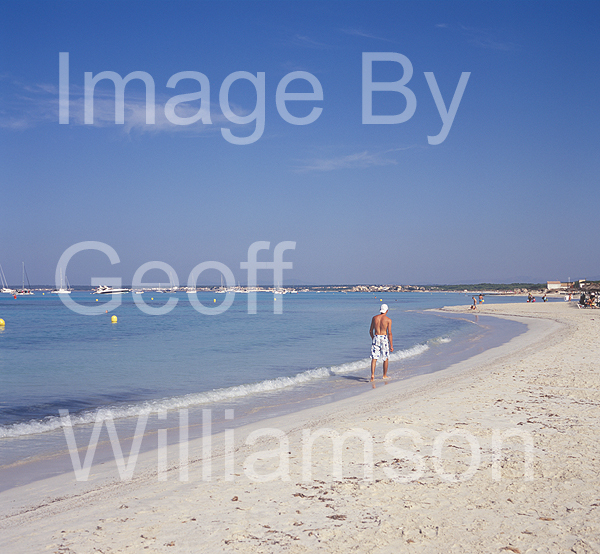 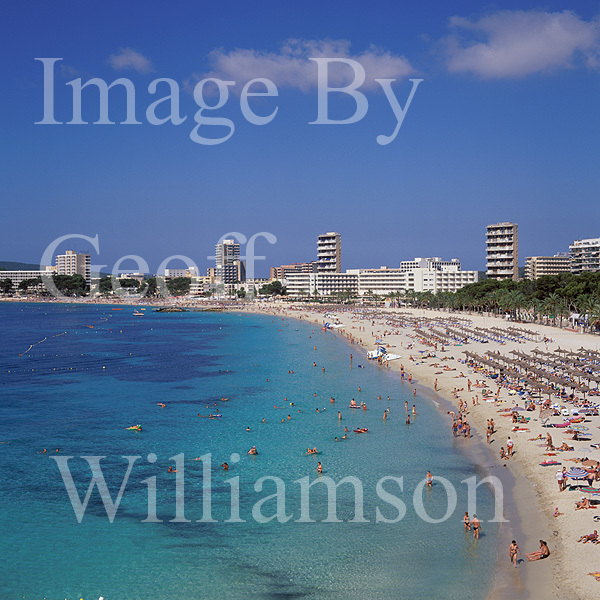 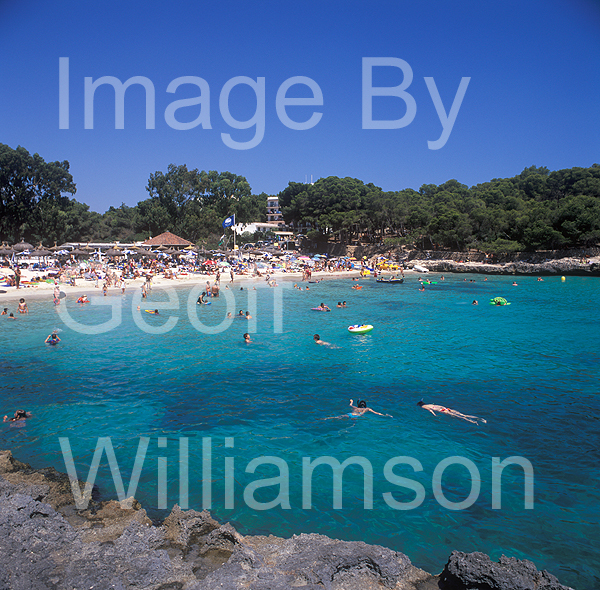 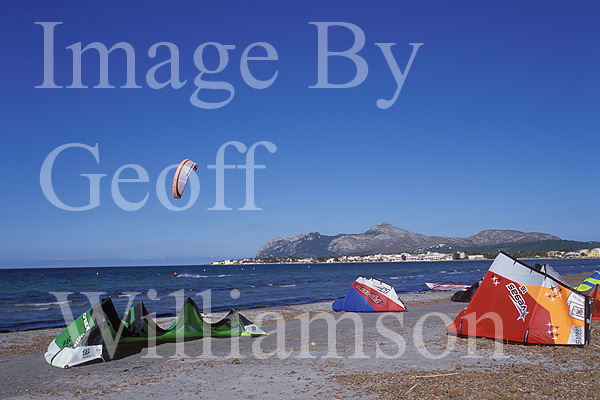 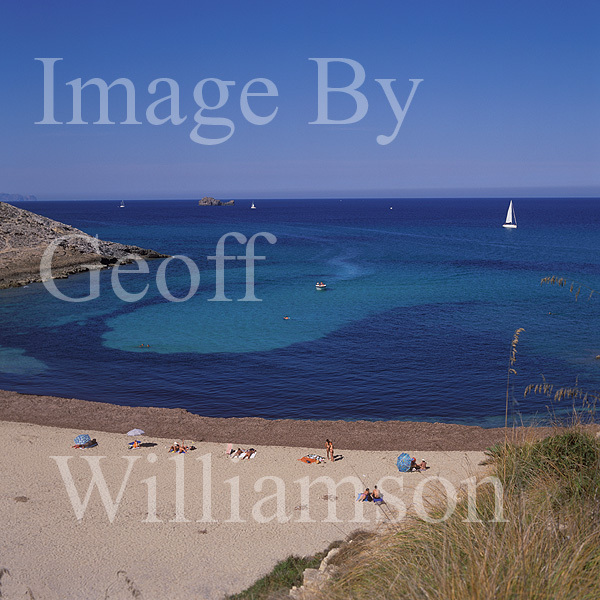 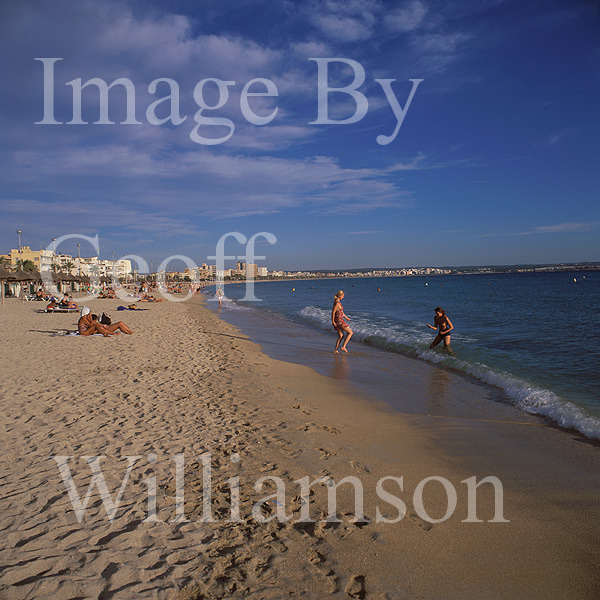 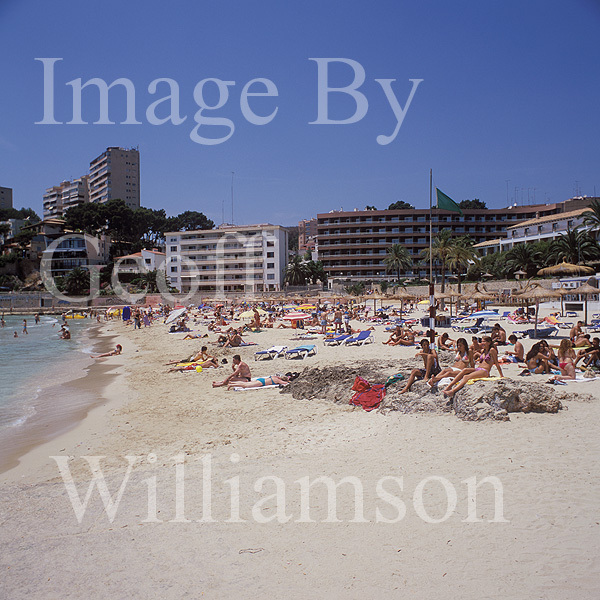 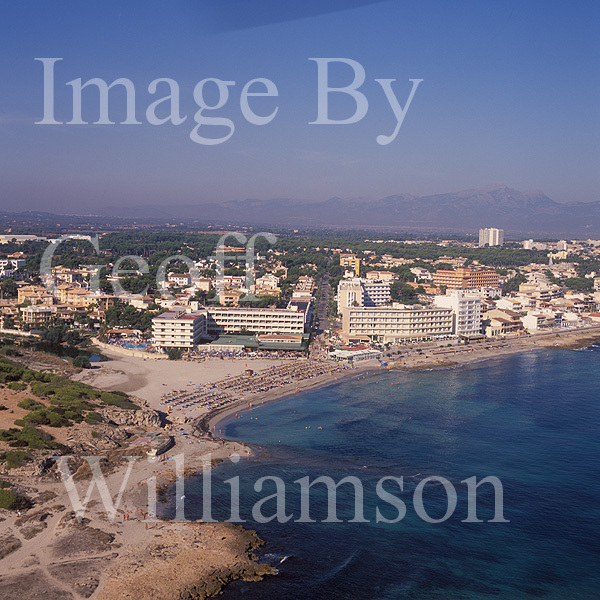 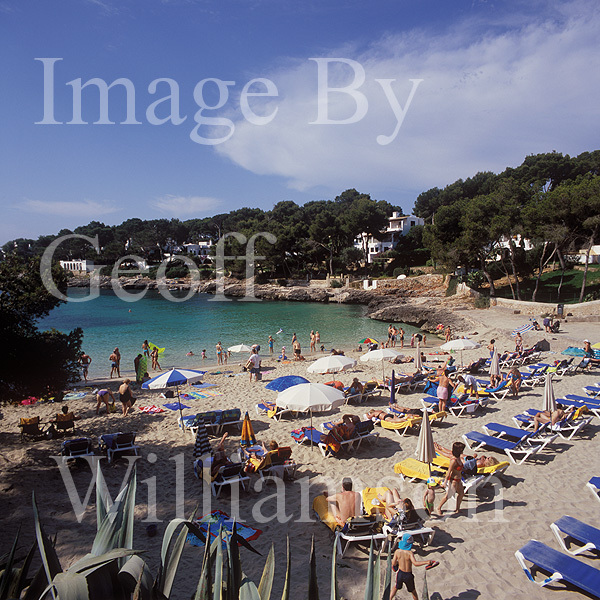 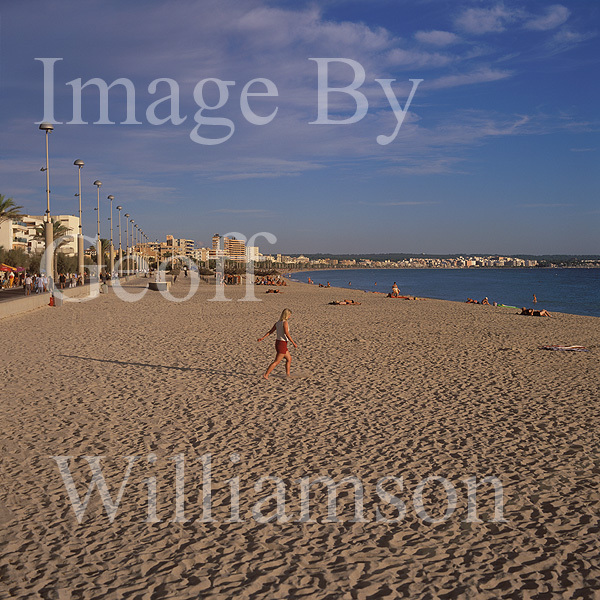 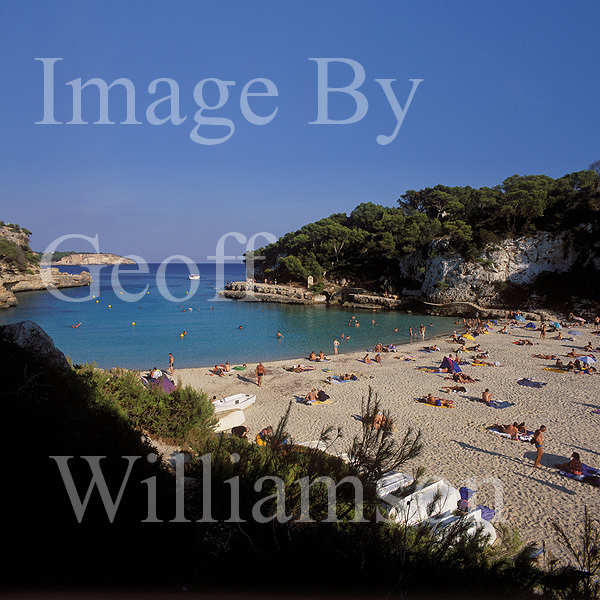 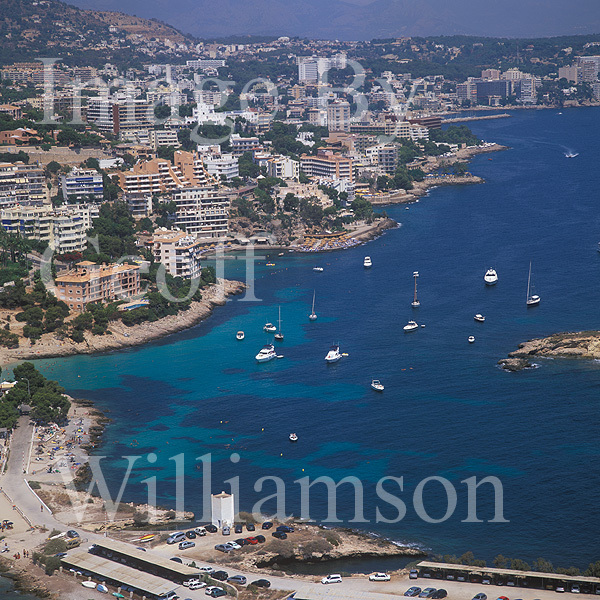 Two very popular sandy beaches with snack bar and restaurant + sunbathing and swimming off the rocky fringe to the cala. 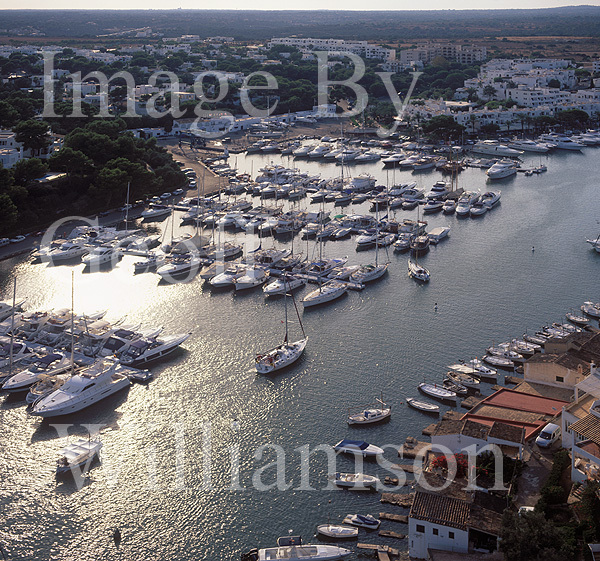 A popular anchorage. 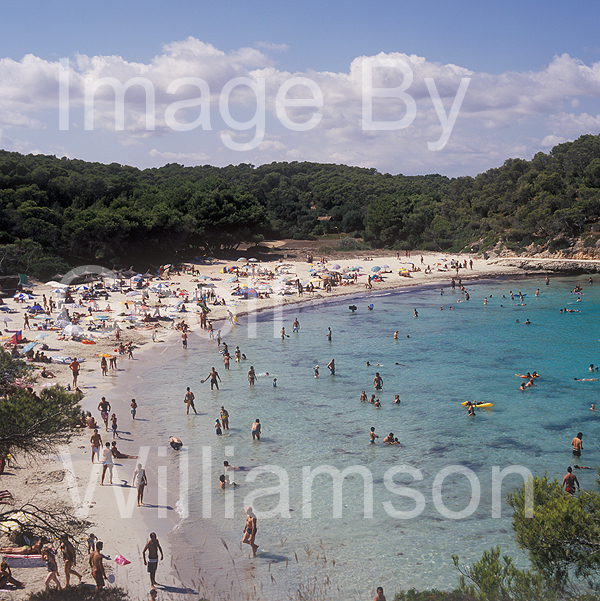 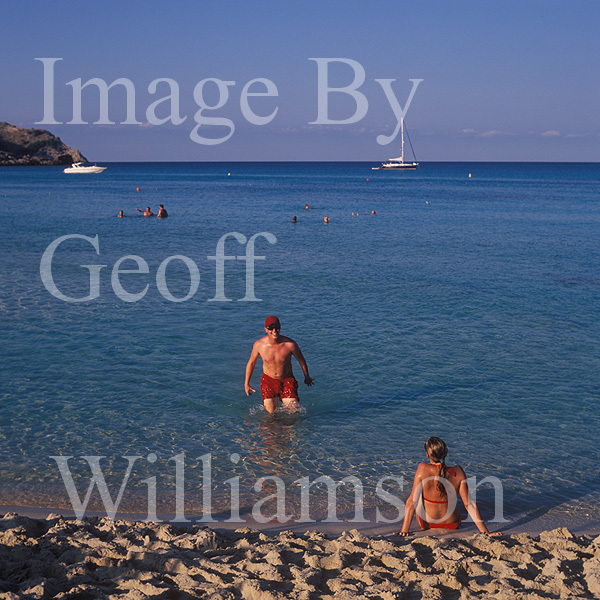 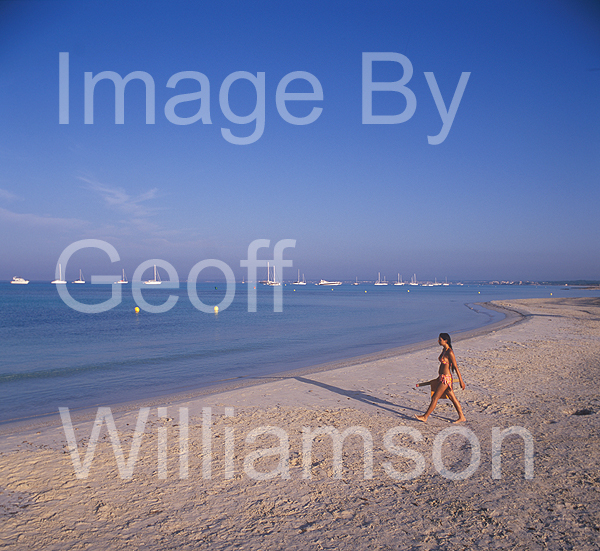 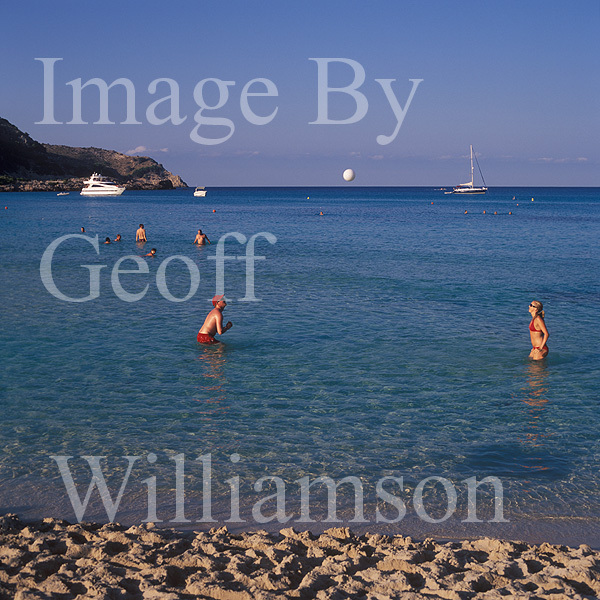 A large well sheltered sandy beach with shallow water - popular with families. 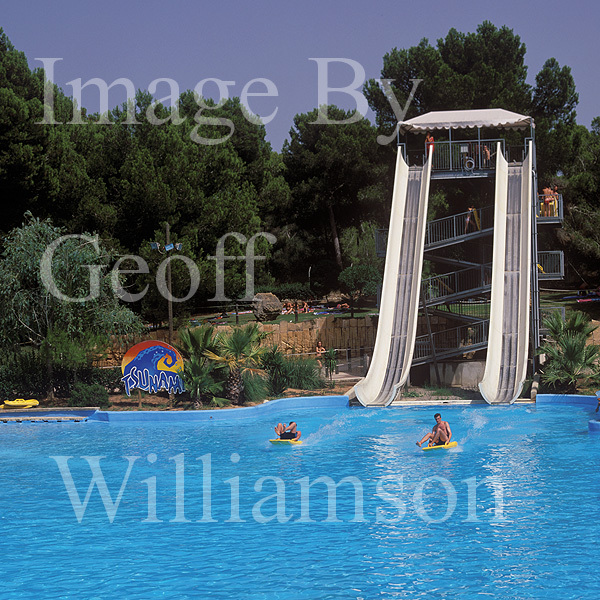 Swimming raft and segregated water sports areas. 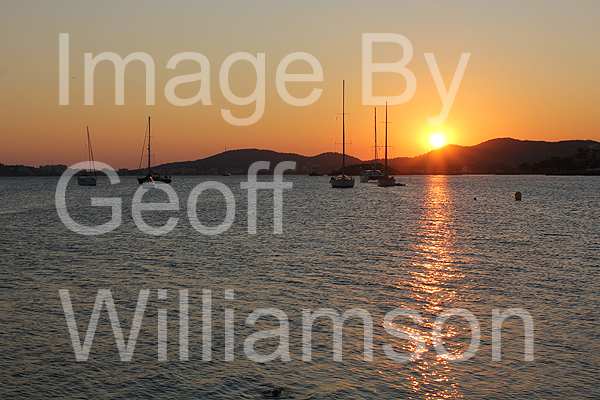 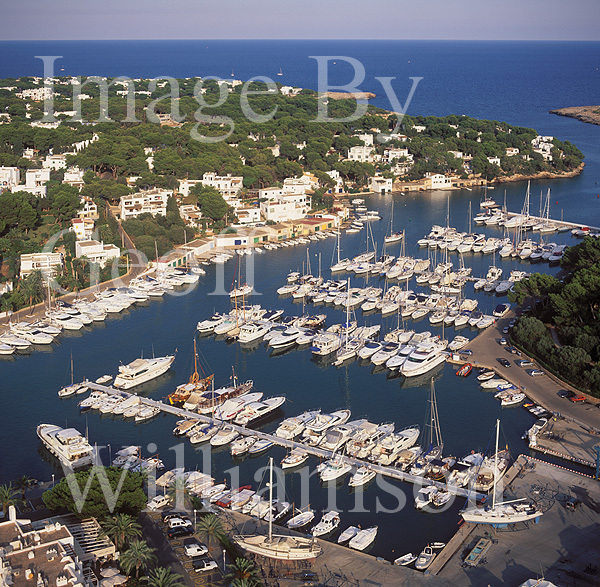 A popular anchorage for craft of all sizes and with a well protected marina. 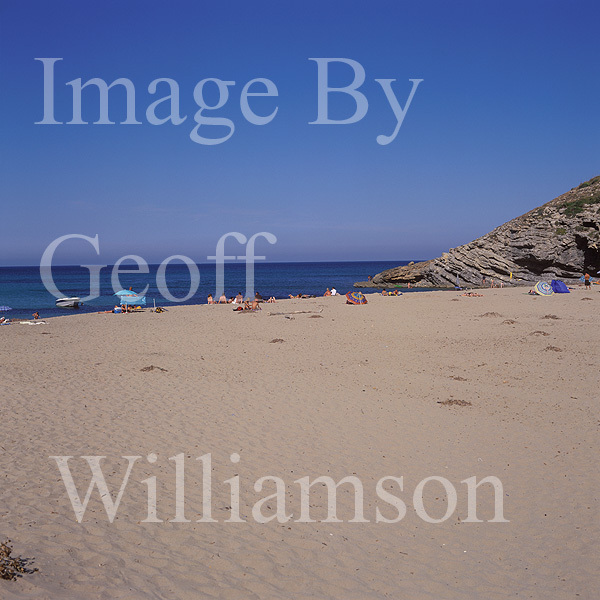 The venue for occasional beach events and the Annual Moors v Christians battle re-enactment. 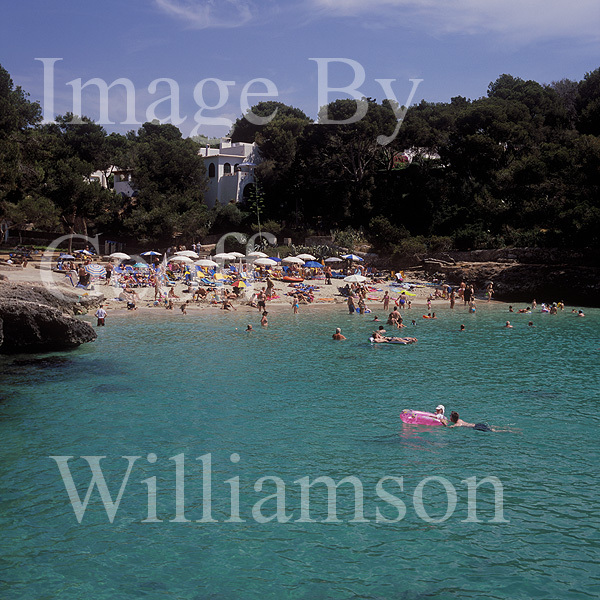 La Romana beach - popular sandy beach. 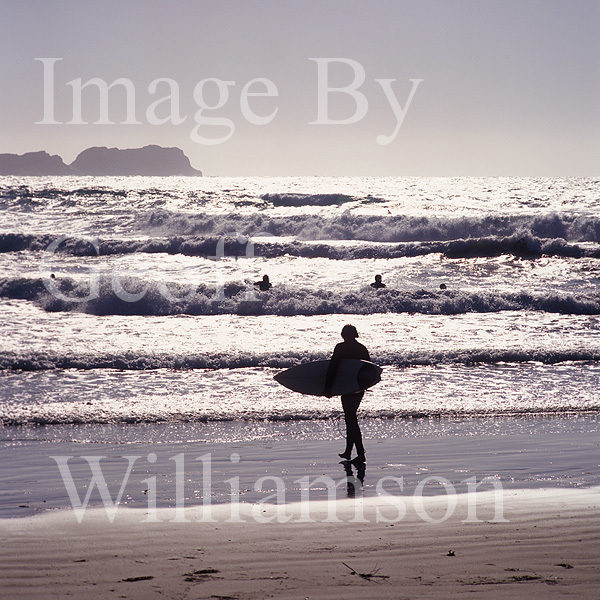 Tora beach - popular sandy beach - early season surf boarding location. 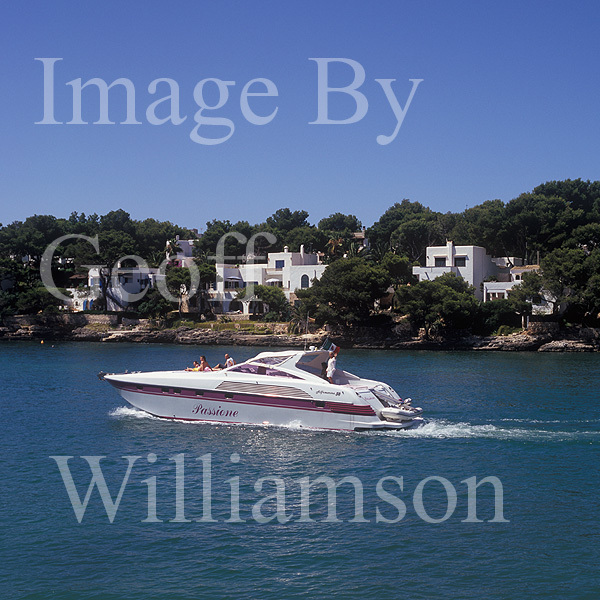 Pedalos and boat trips. 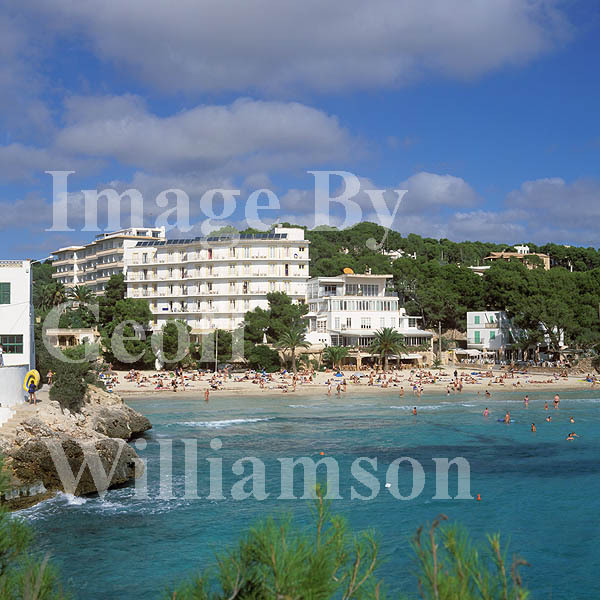 Palmira beach - the largest beach of Paguera - popular family sandy beach well served with beach front bars and restaurants. 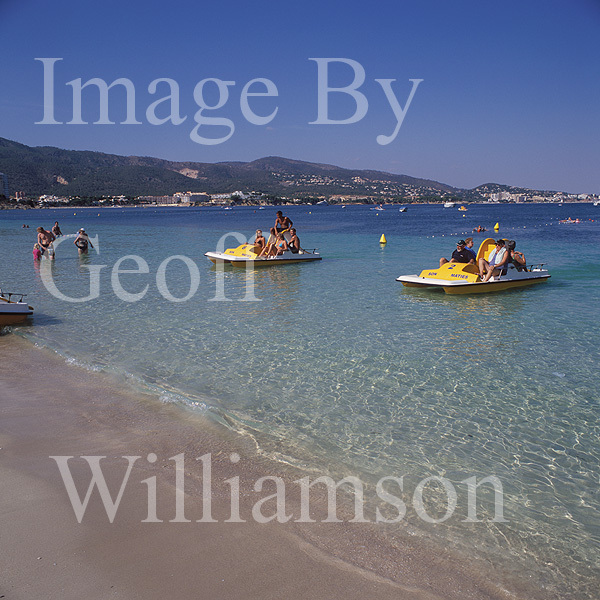 Pedalos and boat trips. 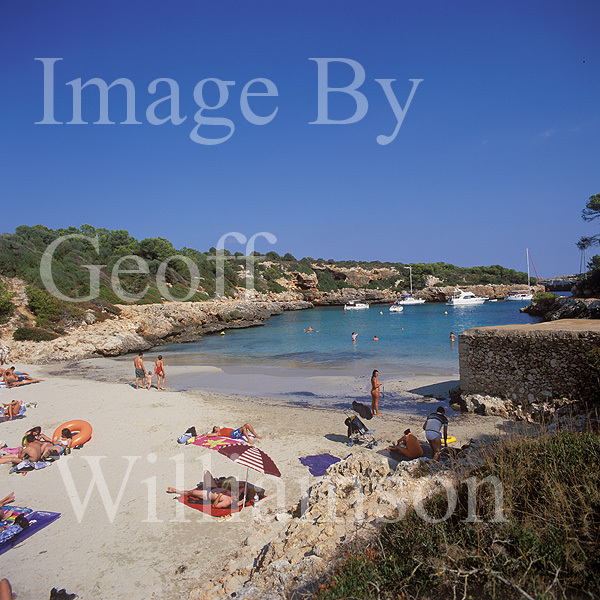 Small sandy beaches with additionally sunbathing and swimming off rocks and concrete platforms. 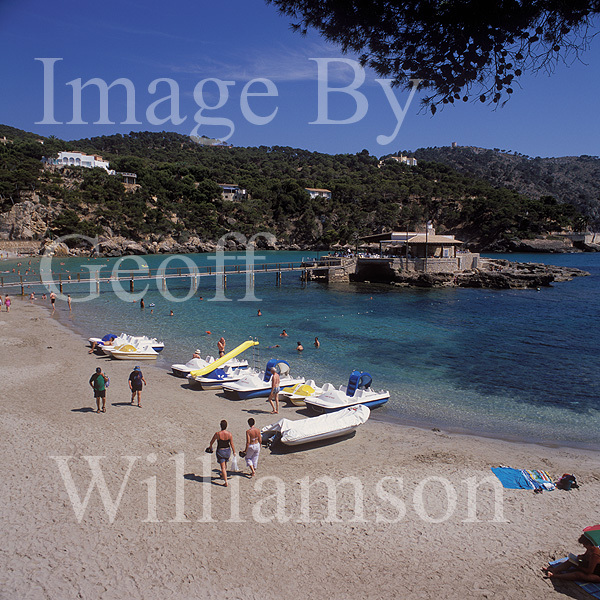 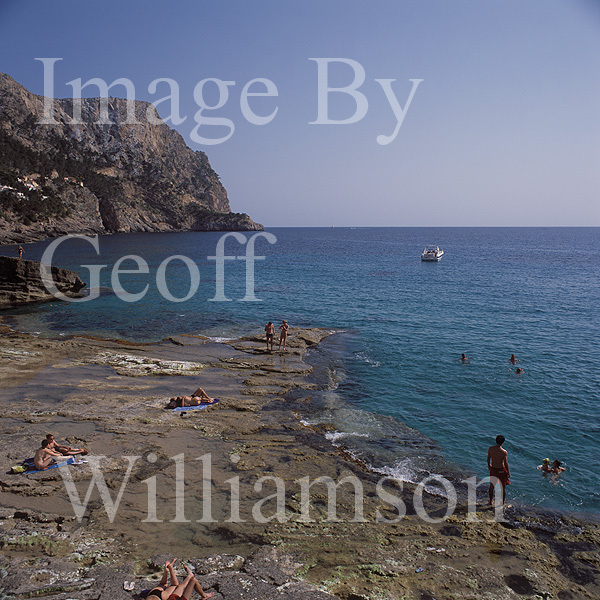 Beach and rock bathing and swimming in this idyllic small bay - a km walk westwards from Cala Fornells. 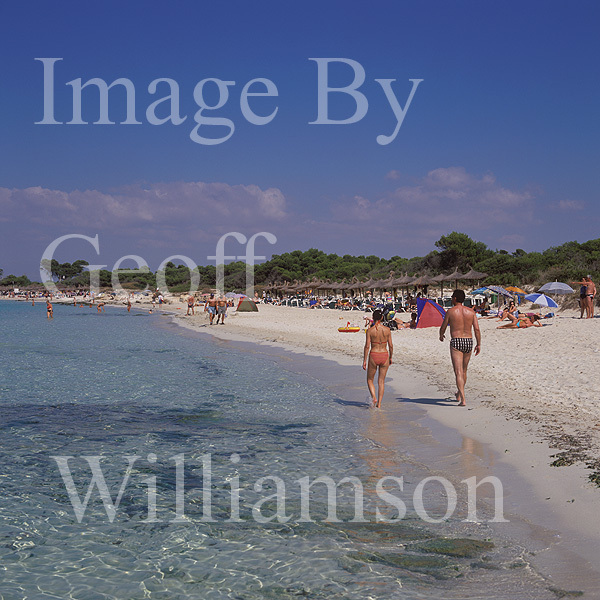 Clothing optional. 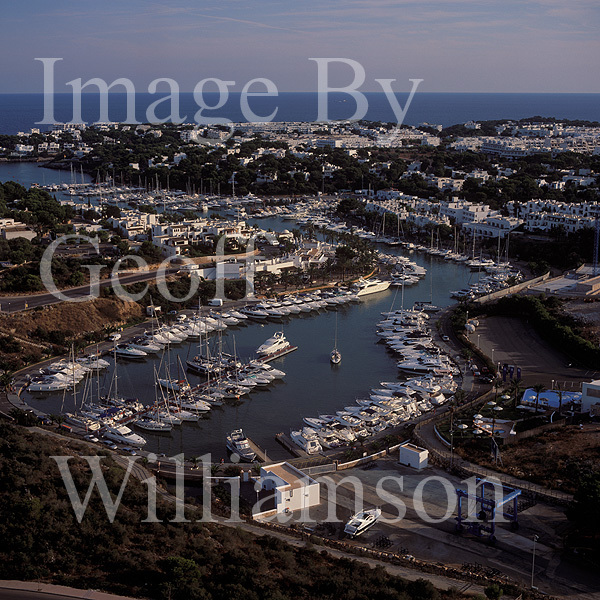 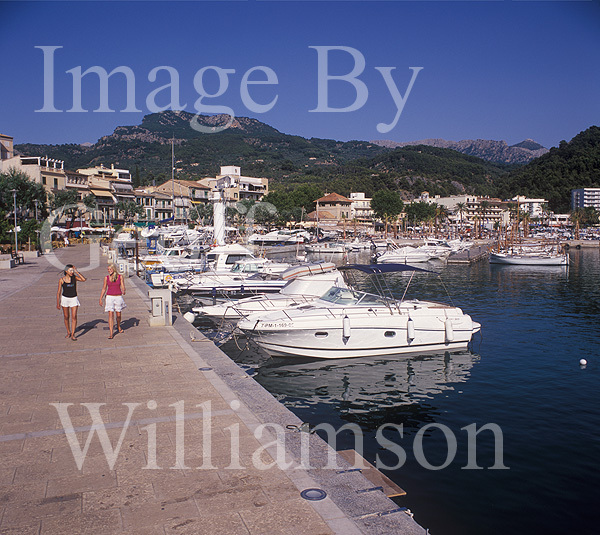 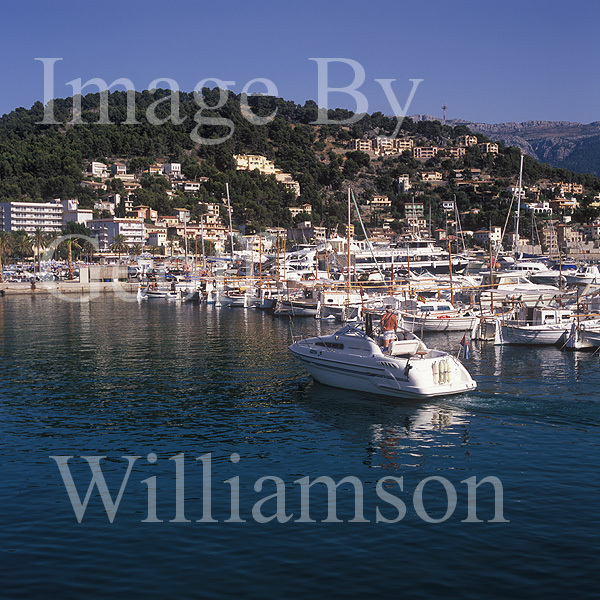 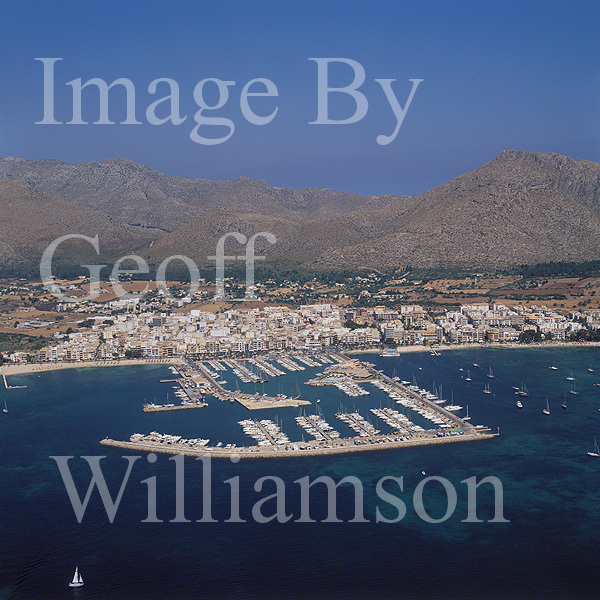 Popular anchorage for small craft. 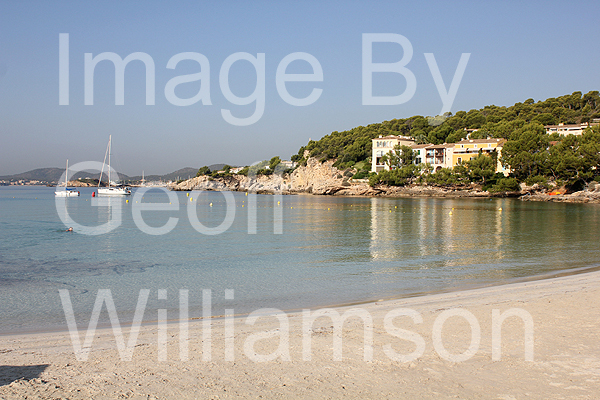 Sandy beach with idyllic restaurant on island. 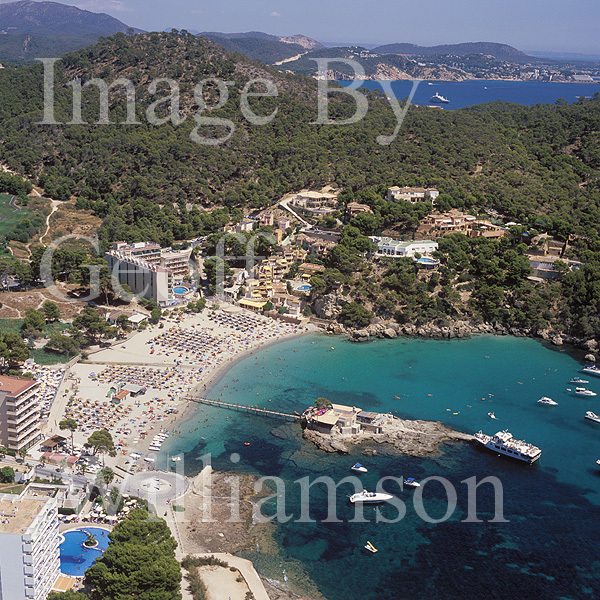 Nearby bars, restaurants, hotels and picturesque golf course. 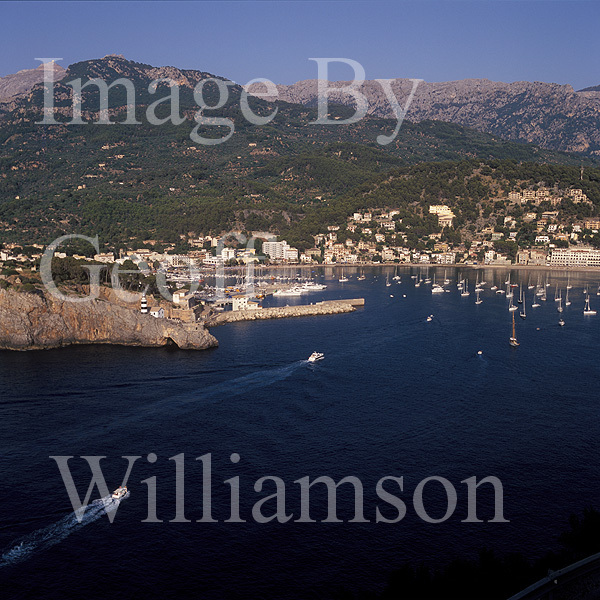 Between Camp de Mar and Puerto Andratx. 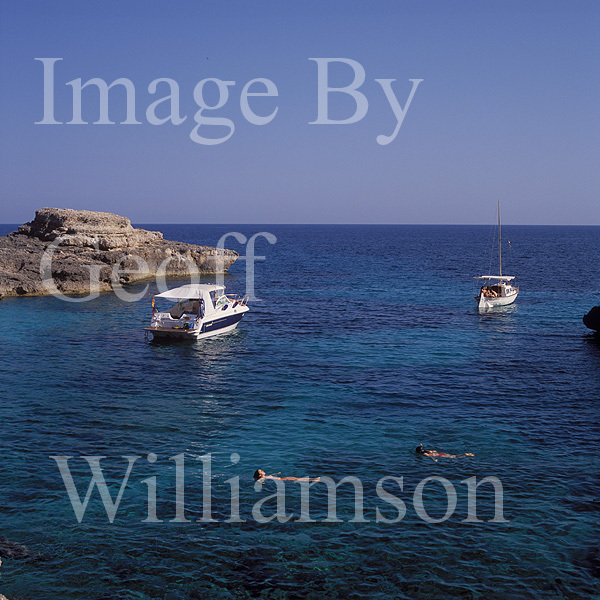 Bathing and swimming off rocks. 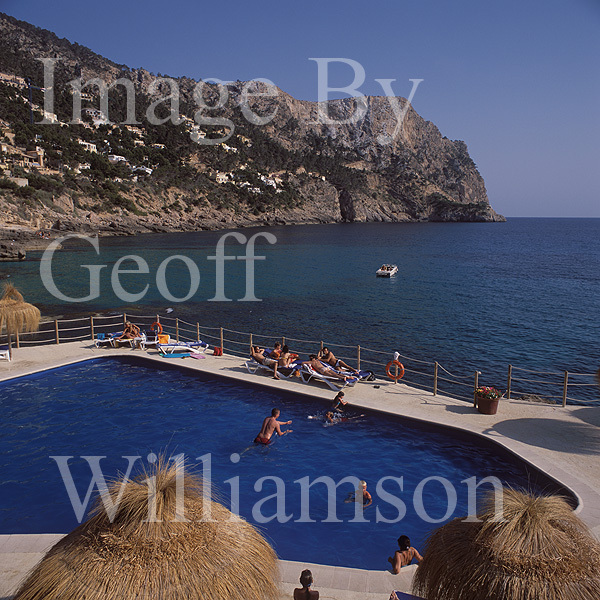 Adjacent restaurant / beach club with pool. 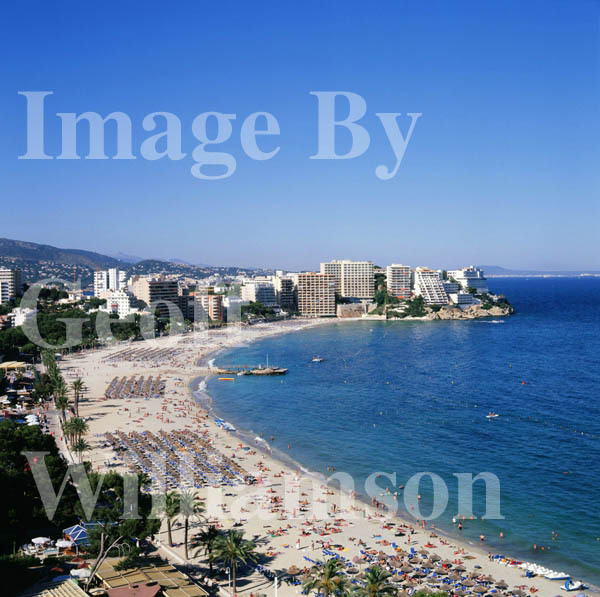 Traditional resort with sandy beach in the lee of Dragonara island. 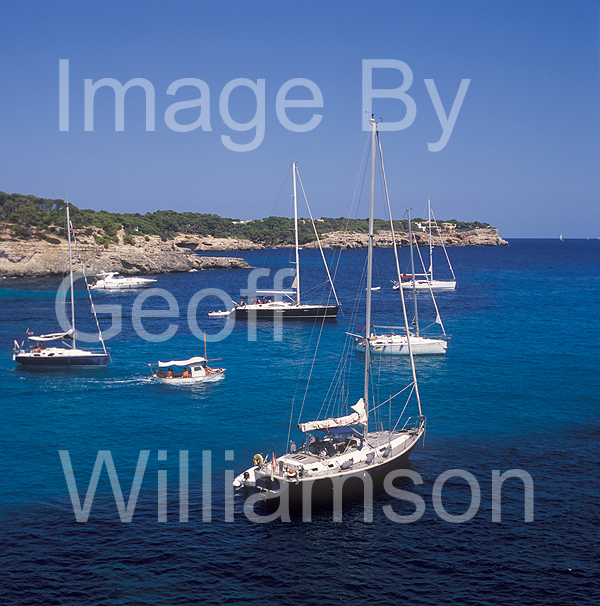 Popular mooring. 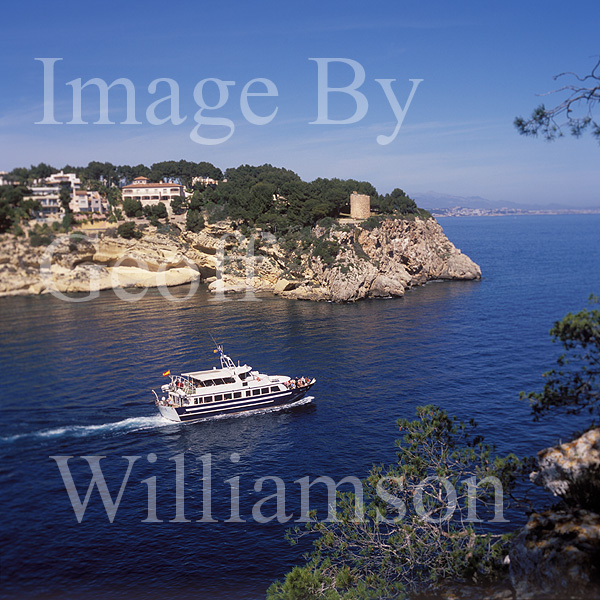 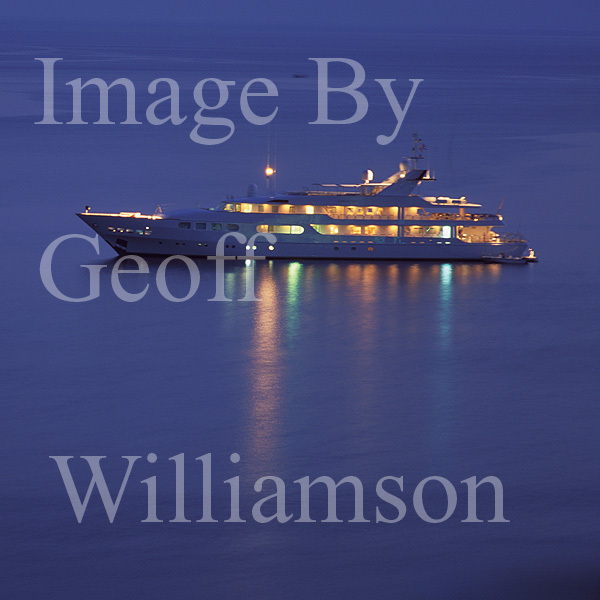 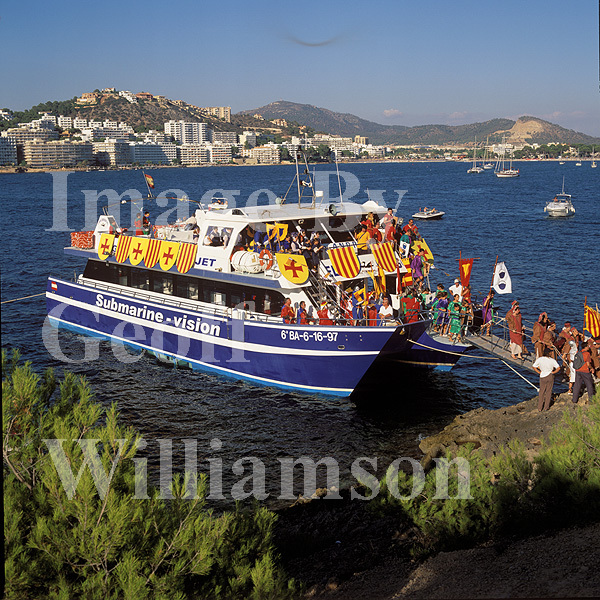 Ferry to Dragonara nature reserve. 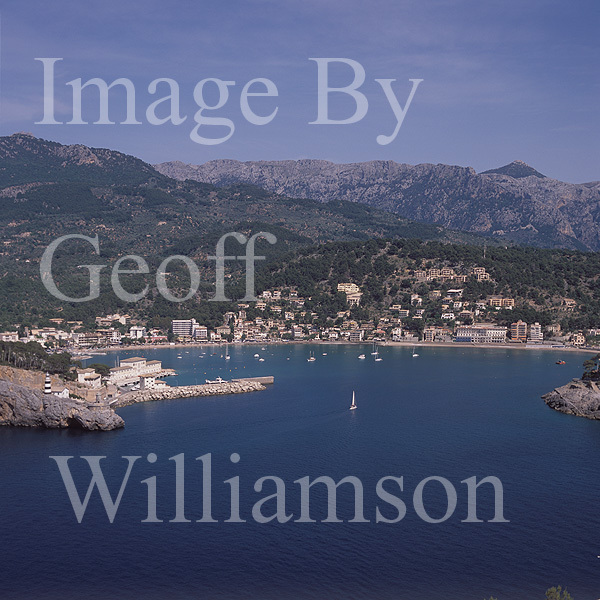 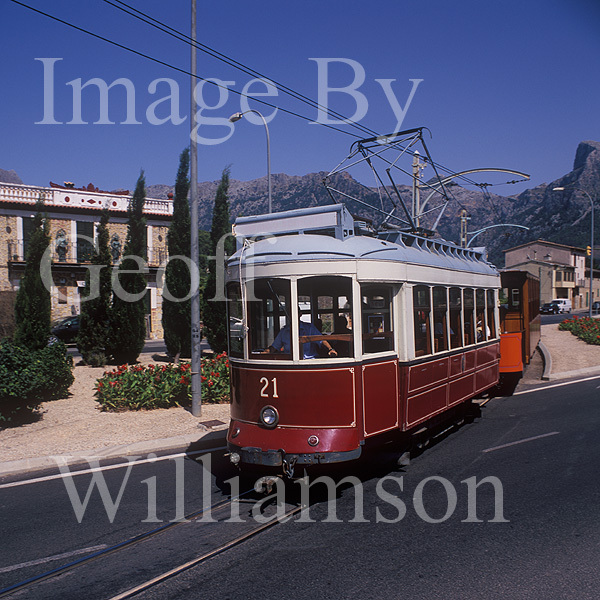 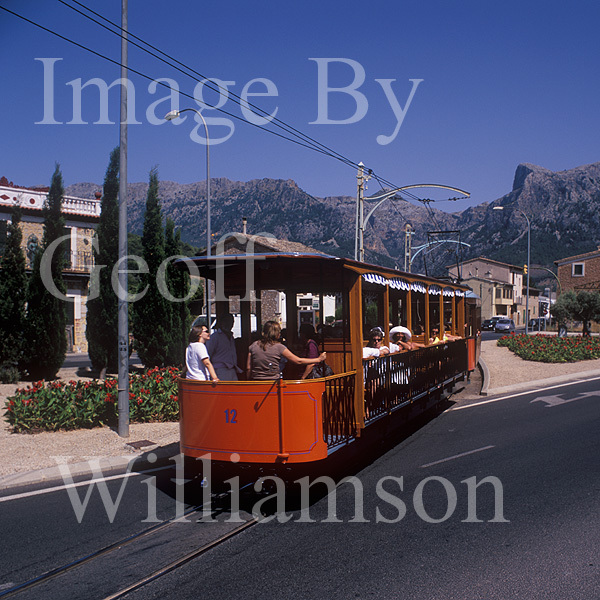 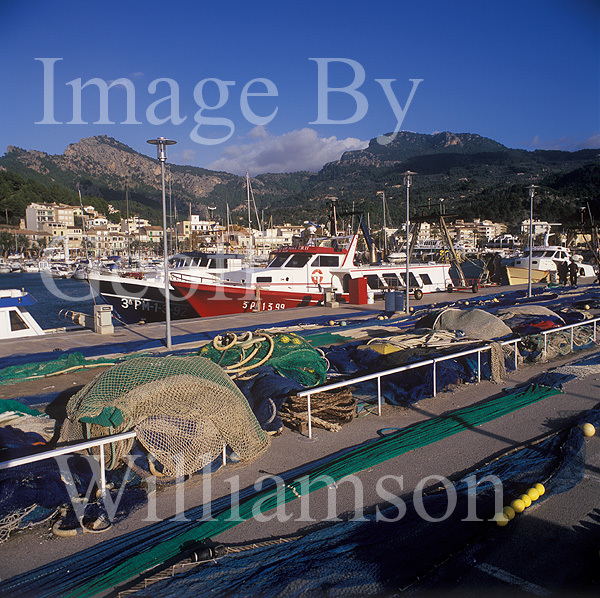 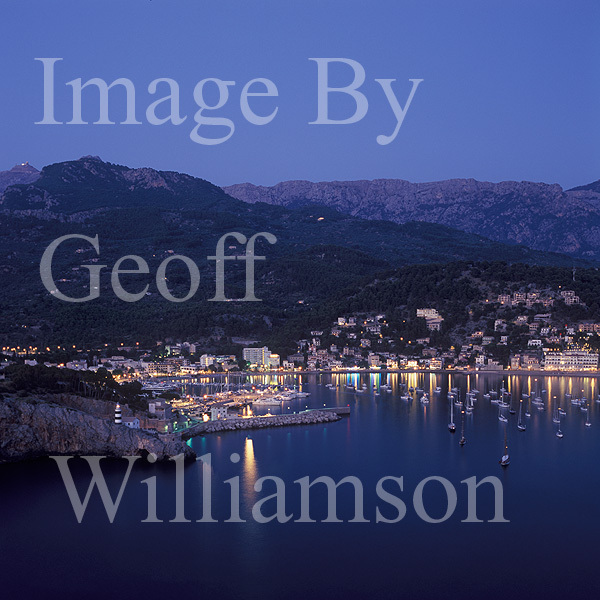 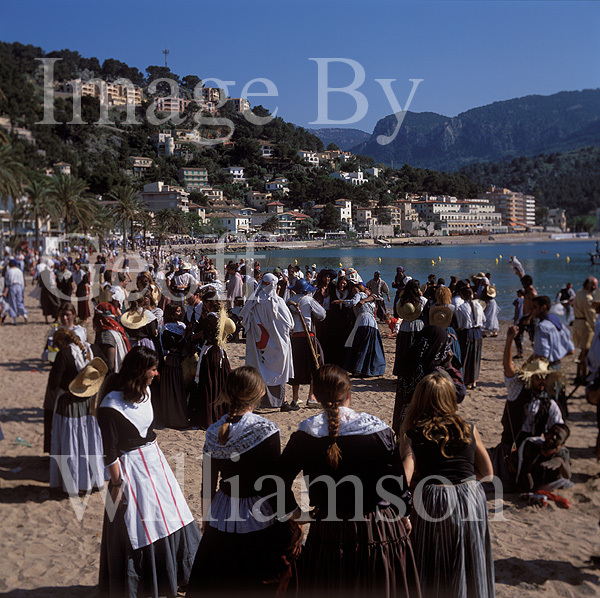 Small sandy beaches to the North and South within the Bay of Soller - well known for superb panoramas, traditional Mallorcan wooden boats ( llauts ), an annual Christians v. Moors battle re-enactment and historic trams.